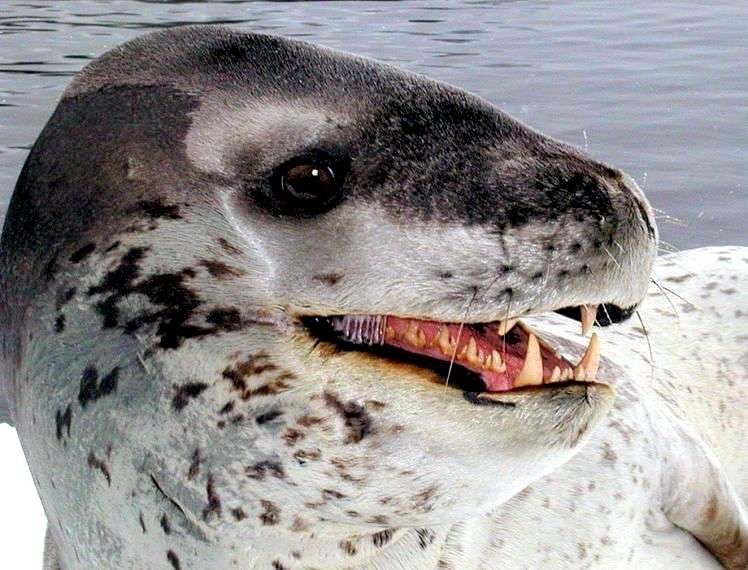 Leopard Seals are large & impressive members of the seal family reaching between 2.41-3.38 meters in length and weighing between 200-591 kilograms. 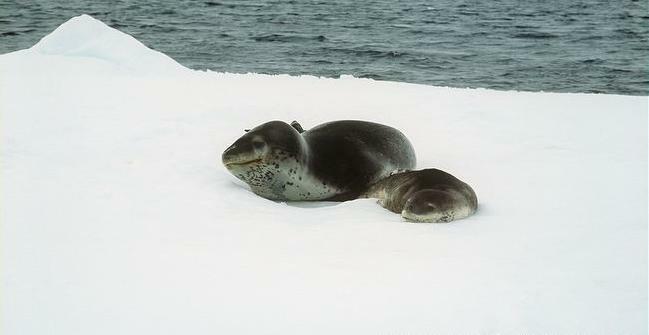 Females are slightly larger than males. 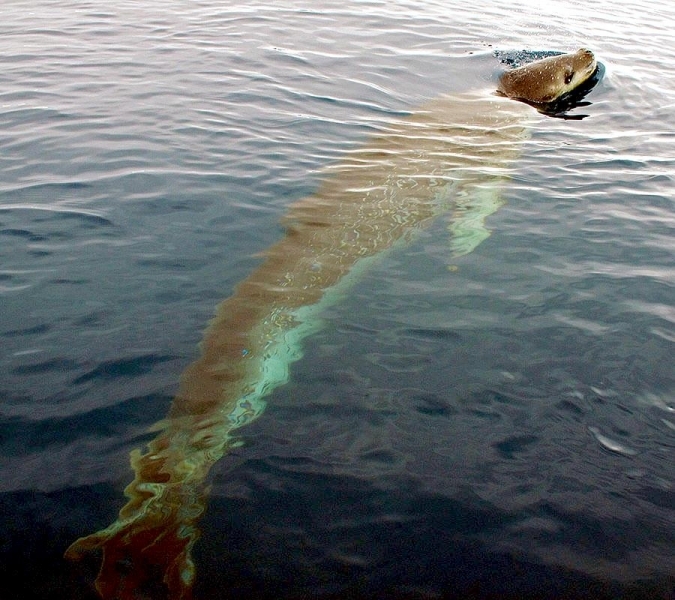 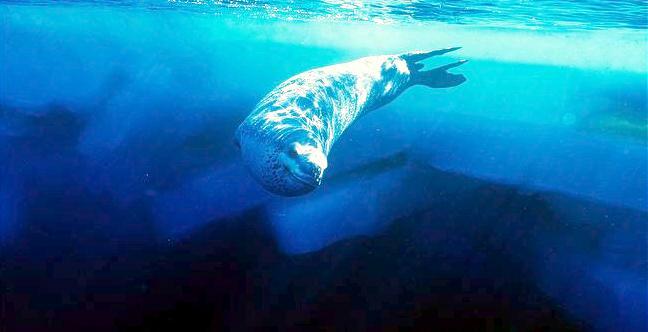 Their massive bodies have large heads and long broad fore-flippers. 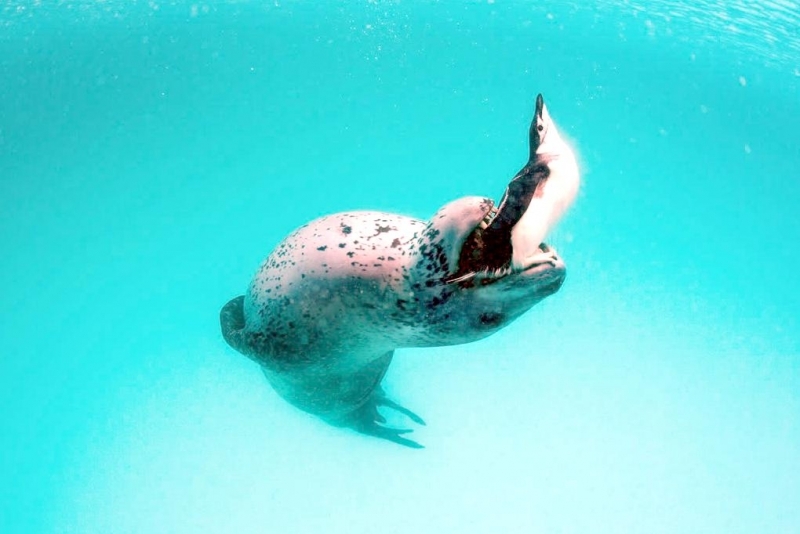 Unlike other seal species that swim by moving their hind limbs side to side, Leopard Seals swim gracefully using long, powerful, simultaneous strokes of the forelimbs simultaneously. 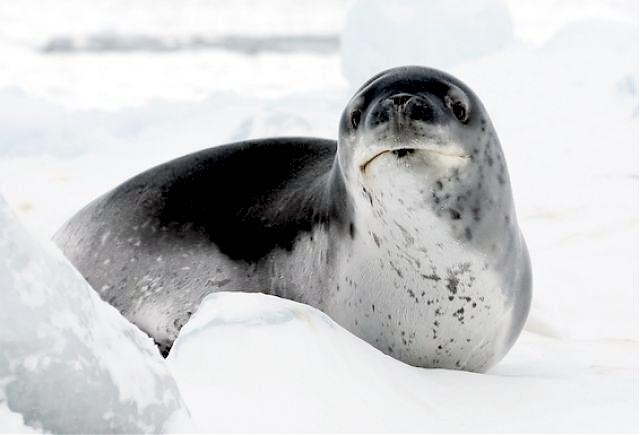 Adults are dark gray to black in color with varying dark spots on their dorsal (upper) side and pale on their ventral (under) side. 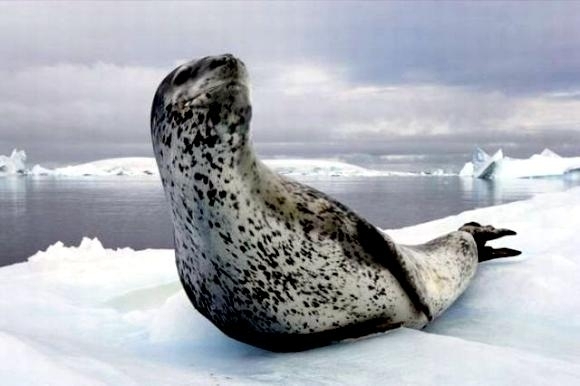 Pup’s have soft, thick coats with a dorsal stripe and black spots on the light gray ventral side. 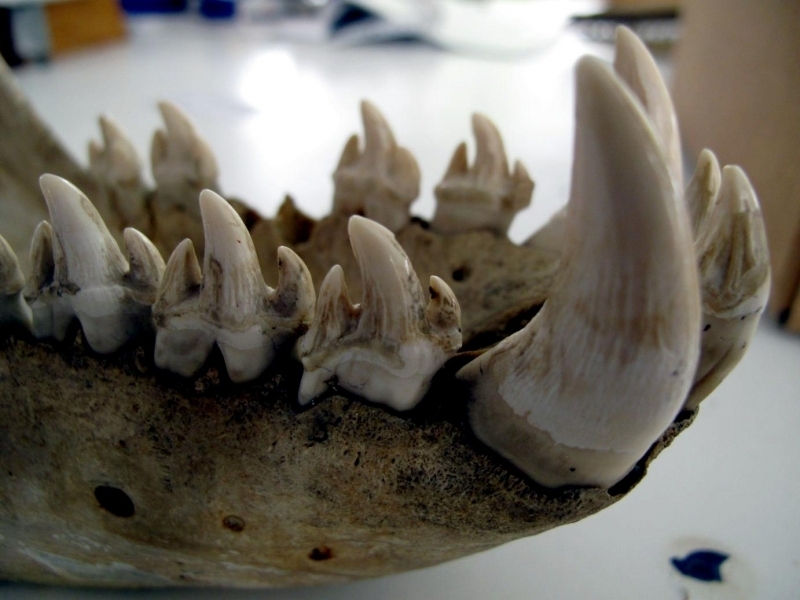 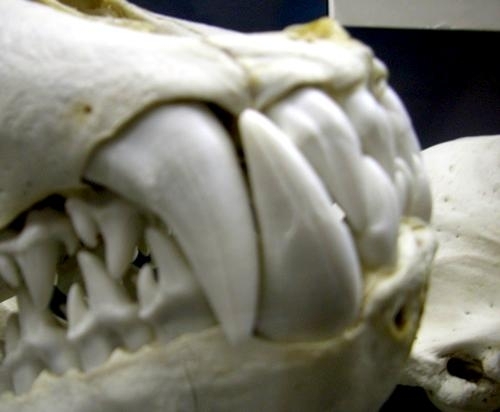 Adults have well-developed canine teeth and 3 tubercles or lobes on the sides of their jaws that allow them to filter krill from the water. 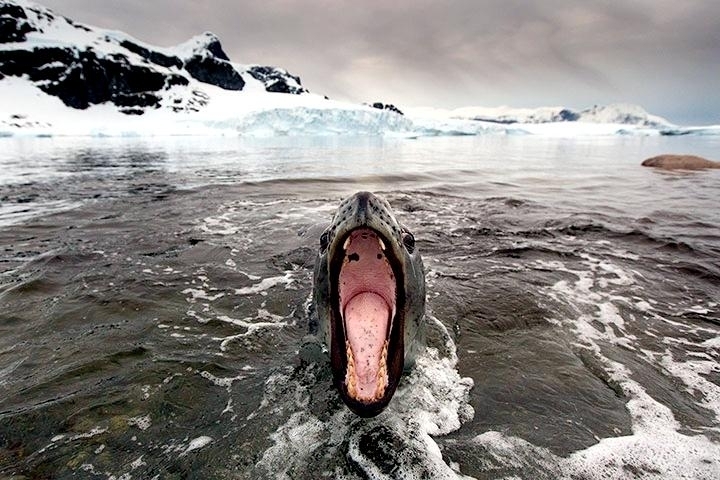 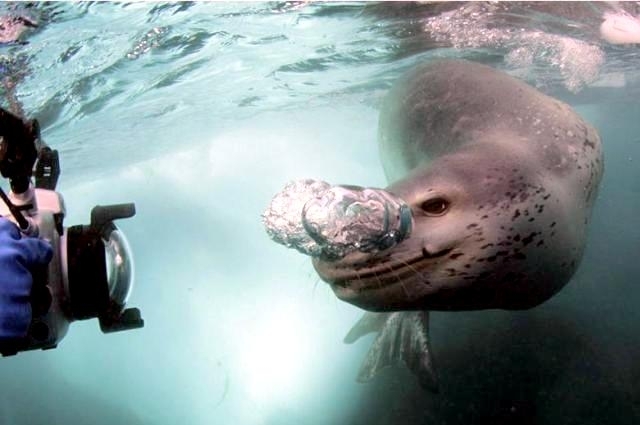 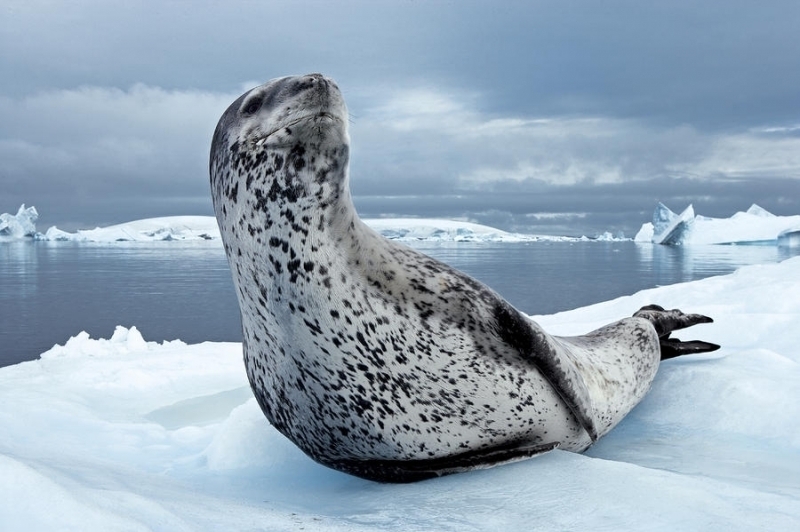 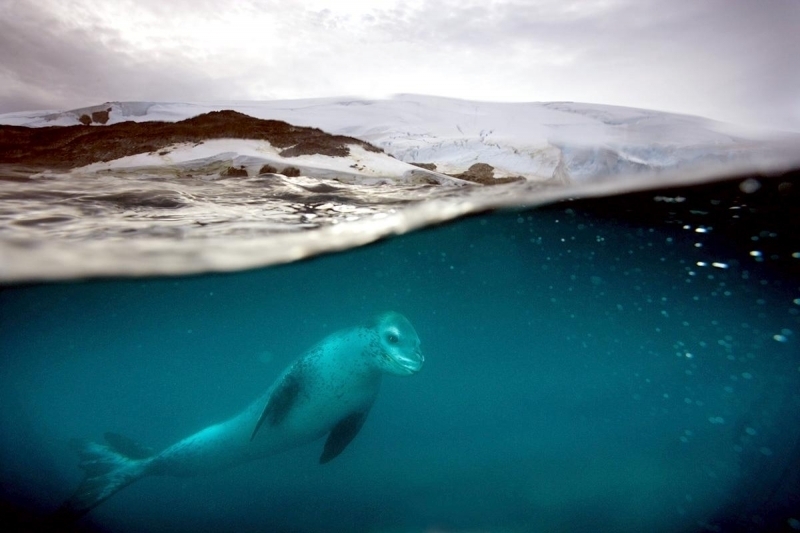 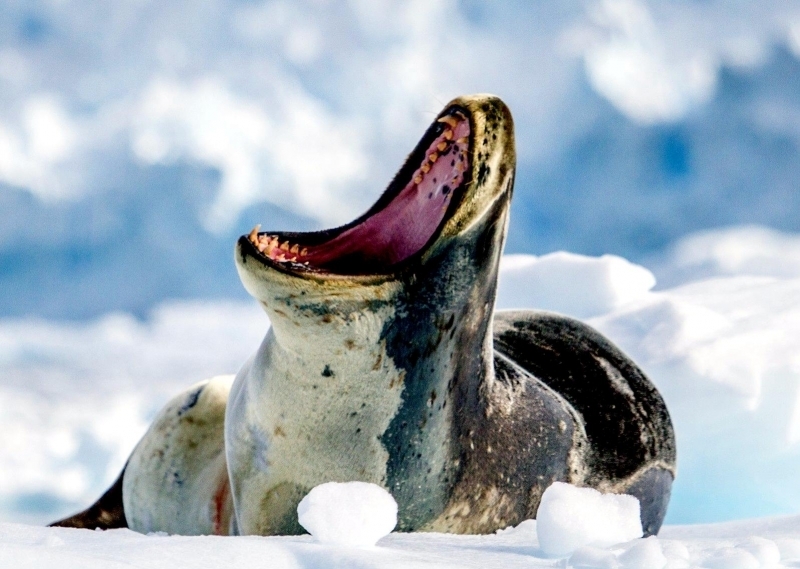 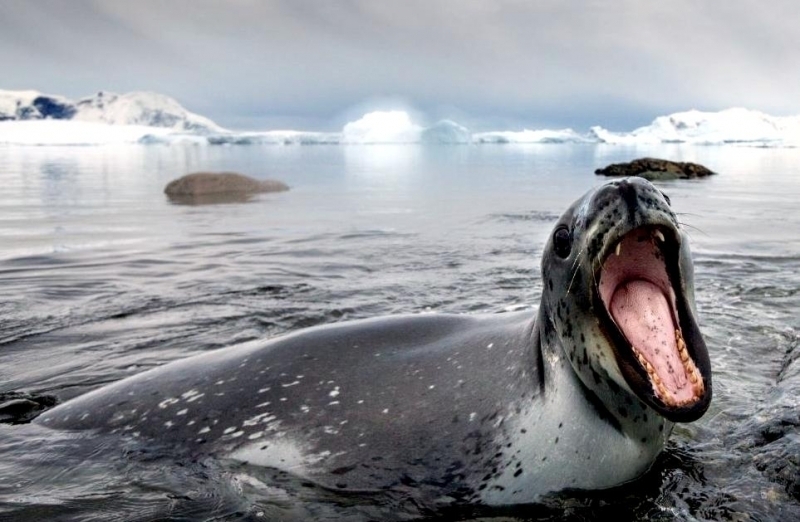 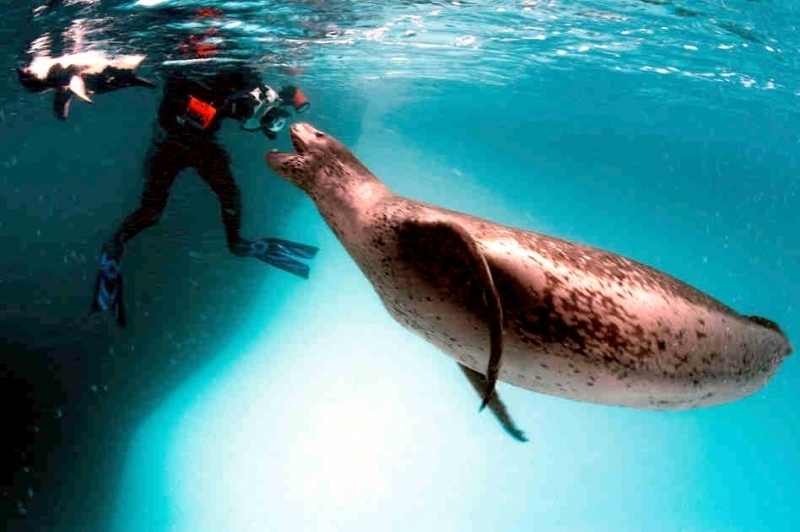 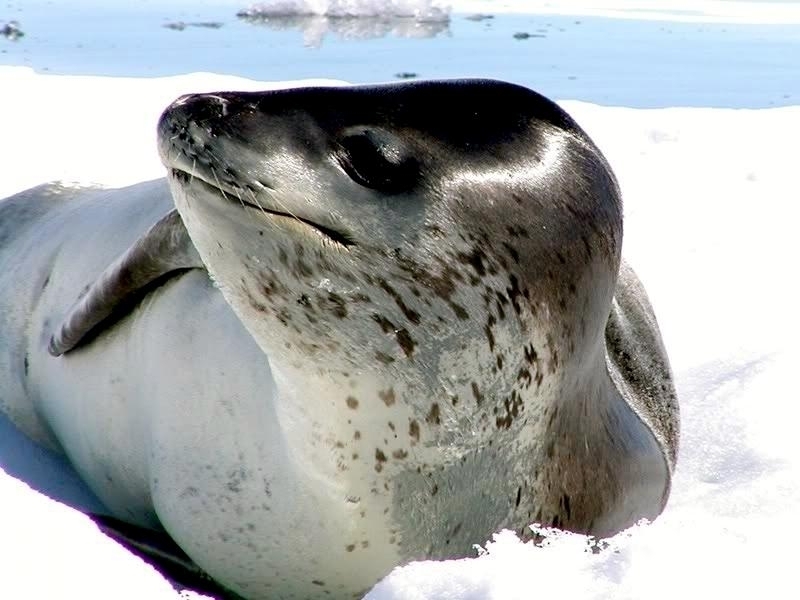 Leopard Seals are wide-ranging found in the Atlantic and Pacific oceans and in the polar & sub-polar waters of the Southern Hemisphere along the coast of Antarctica and on many sub-Antarctic islands. 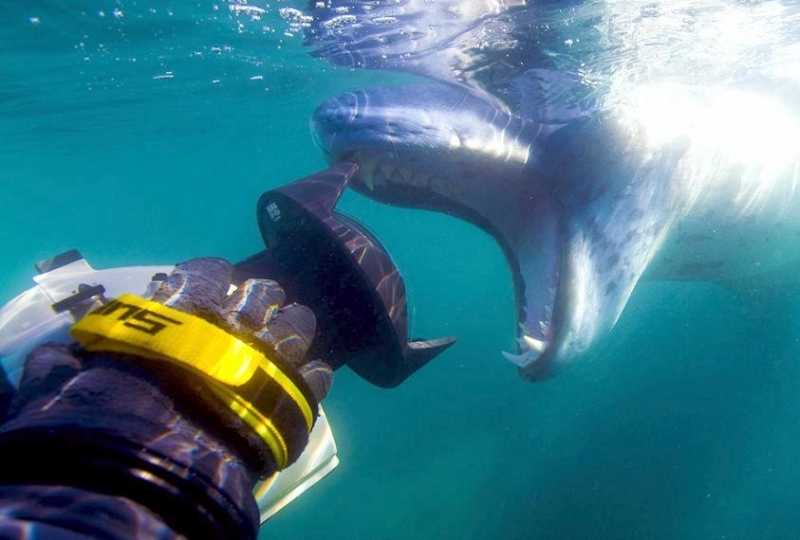 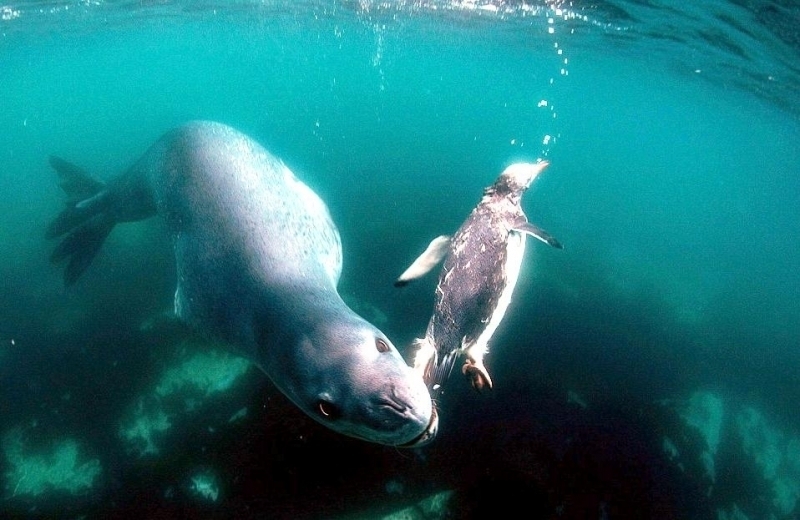 They’ve also been seen on the South African & South Australian coasts around Tasmania, Lord Howe Island, the Cook Islands and Tierra del Fuego. 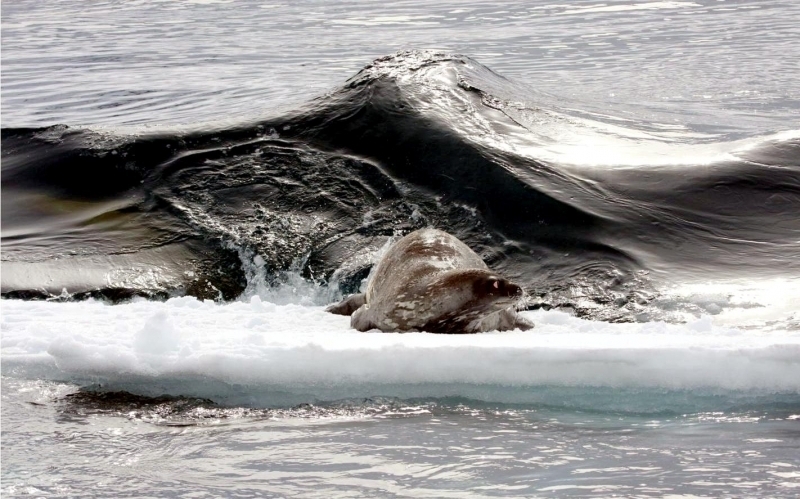 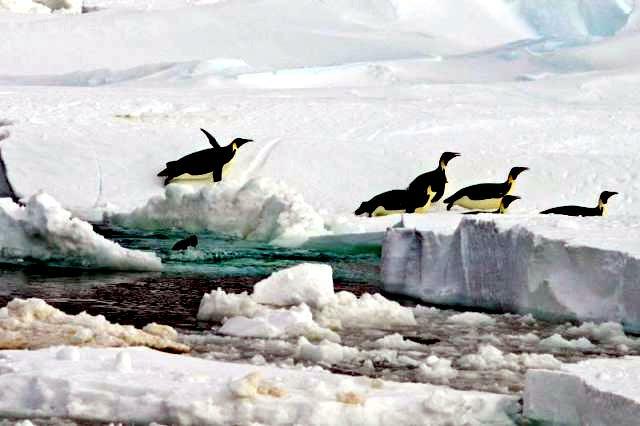 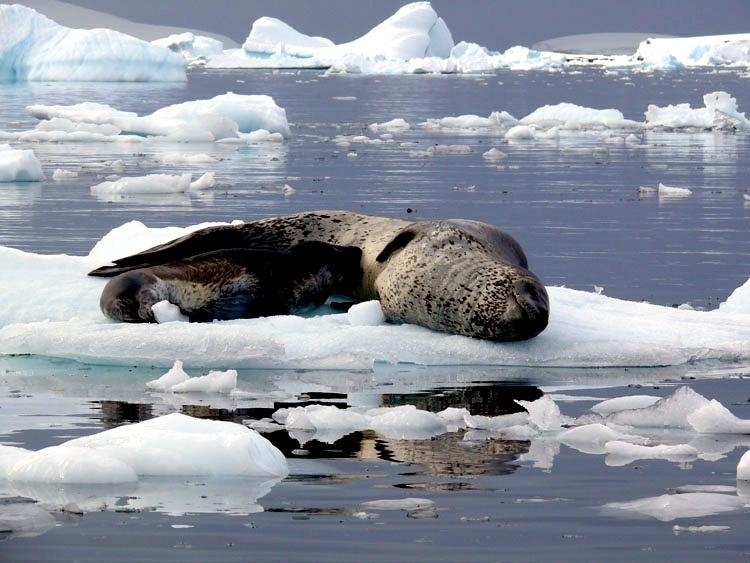 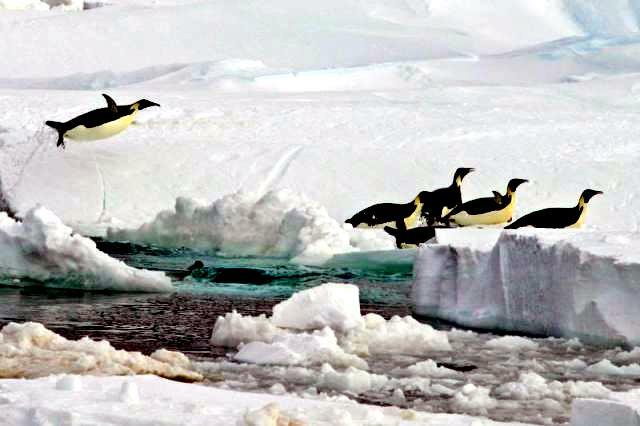 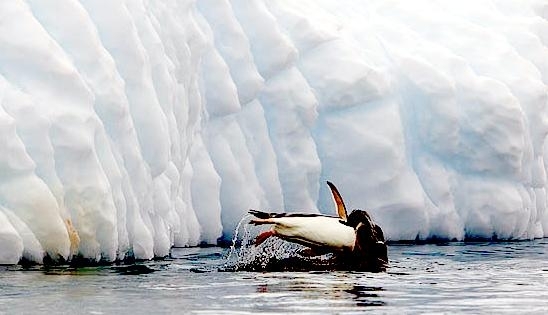 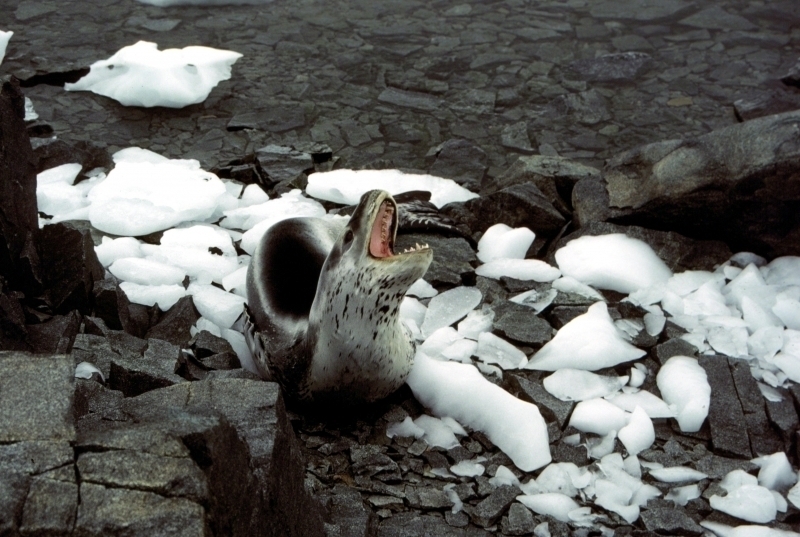 Adults are found on the outer fringes of ice pack. 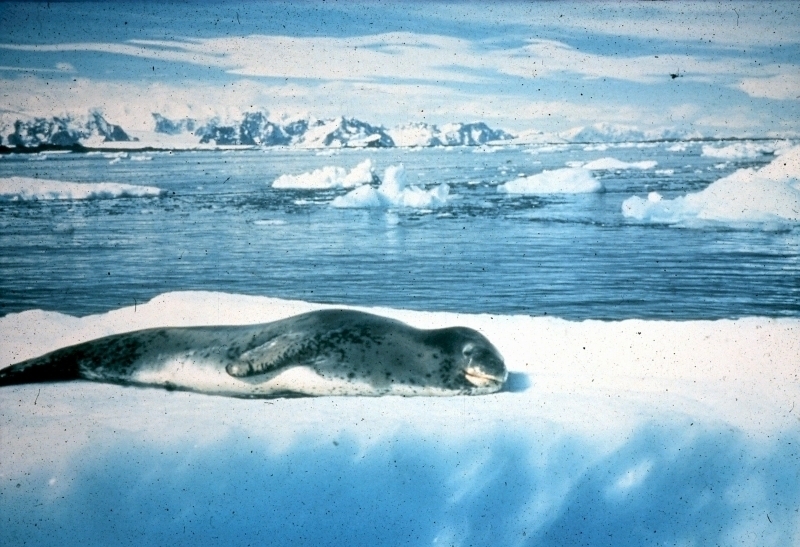 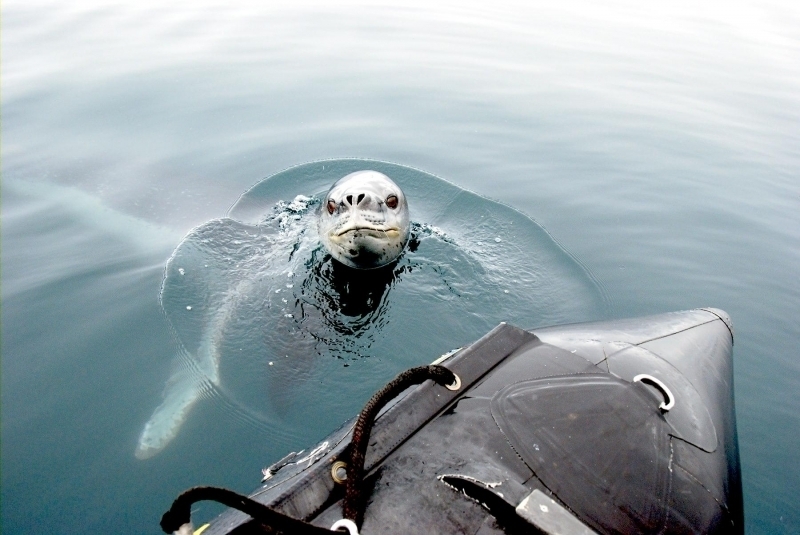 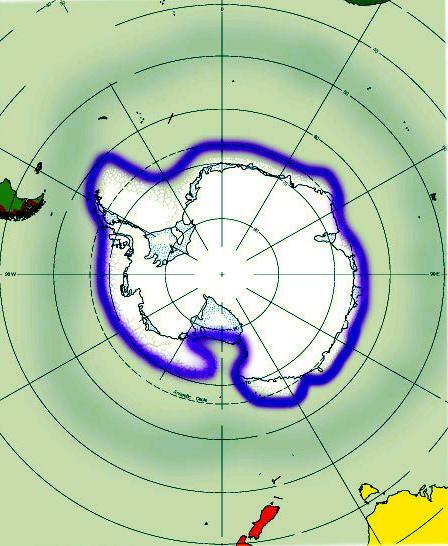 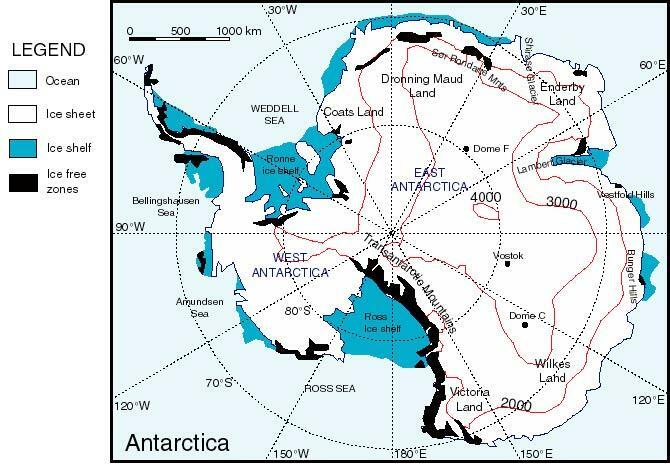 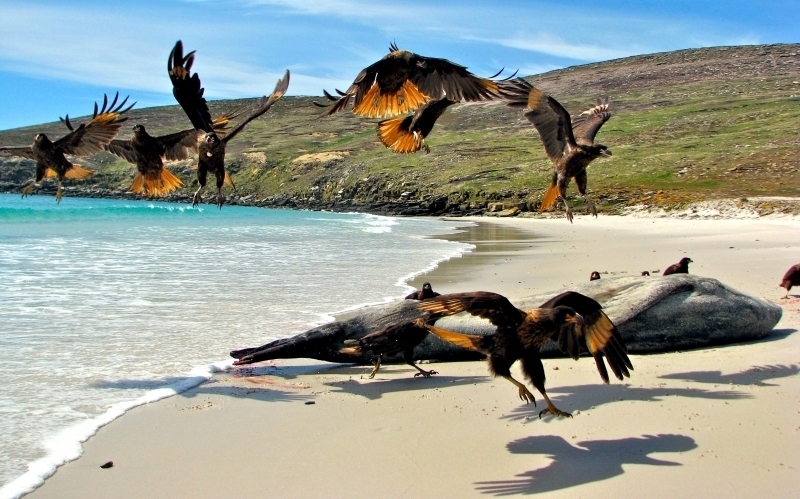 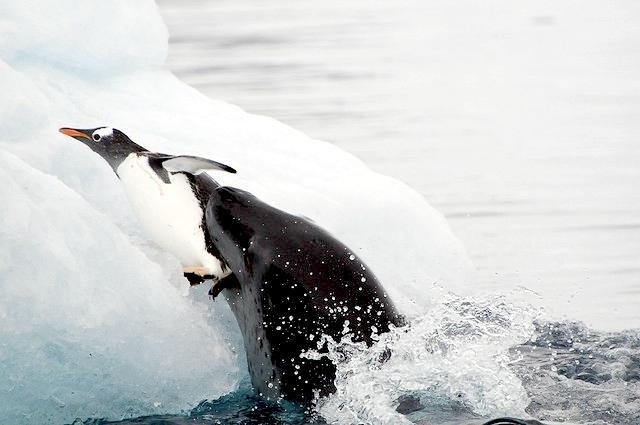 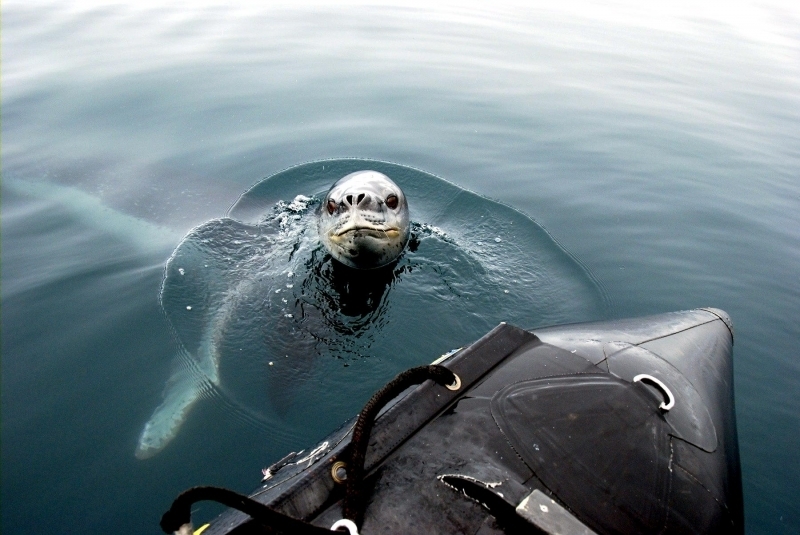 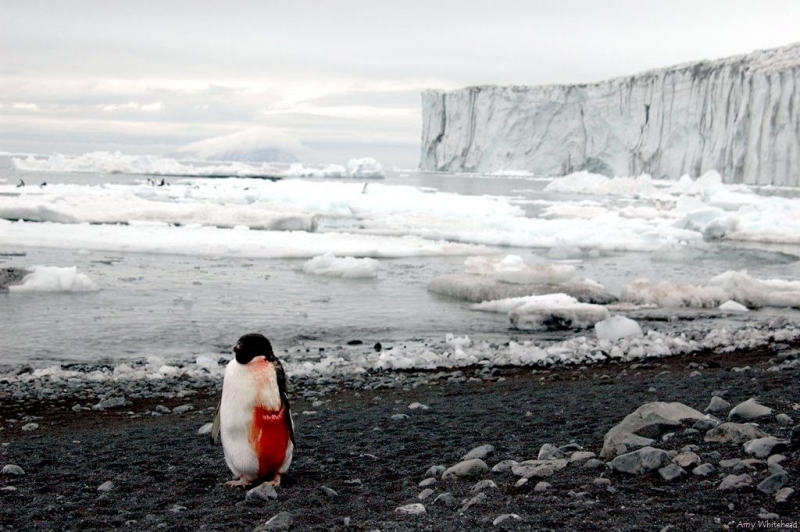 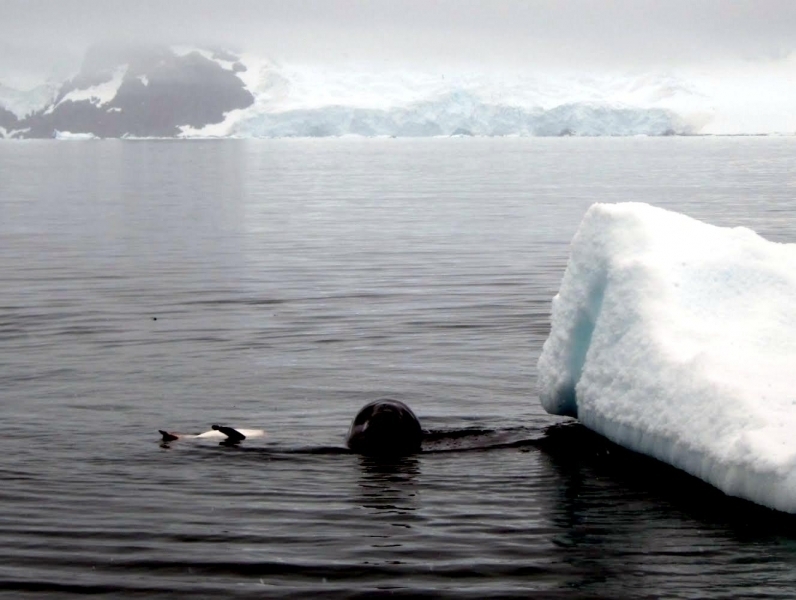 The young are found around sub-Antarctic islands. 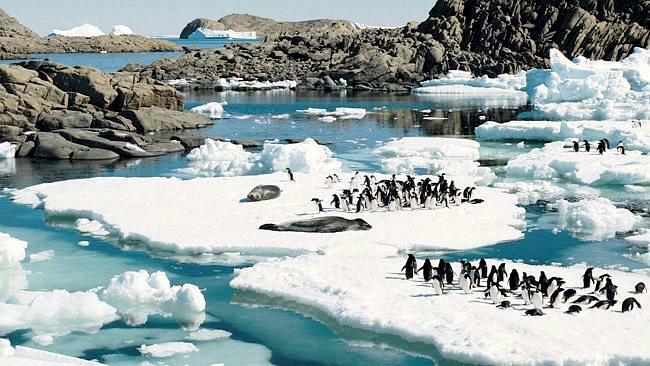 Population size is difficult to calculate because they live in an area difficult to reach. 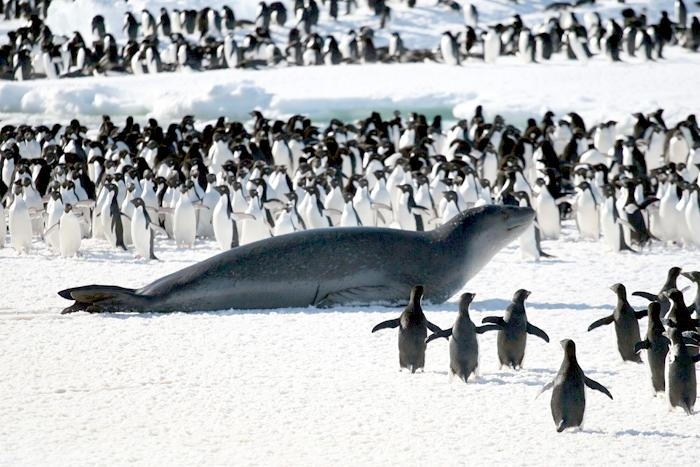 Their population size has been estimated at 220,000-440,000. 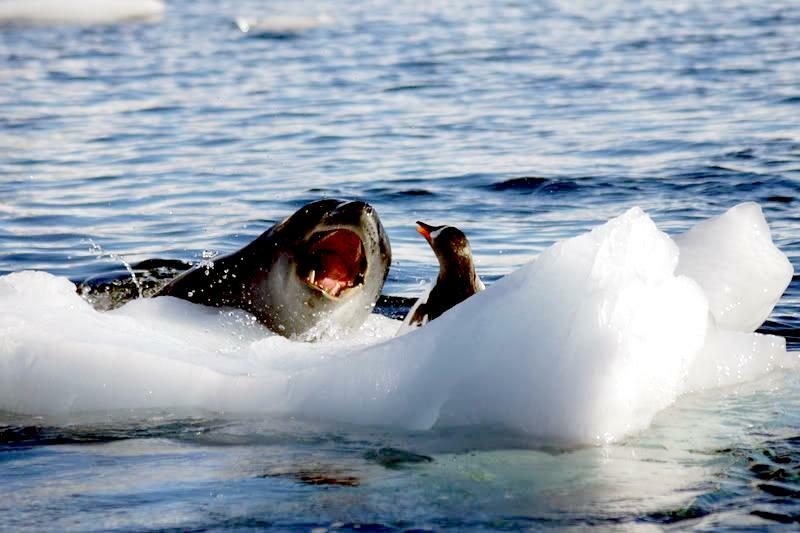 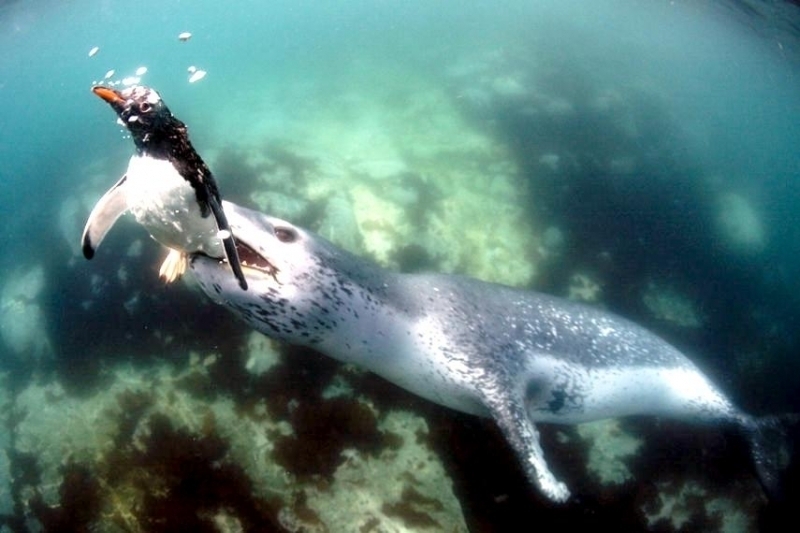 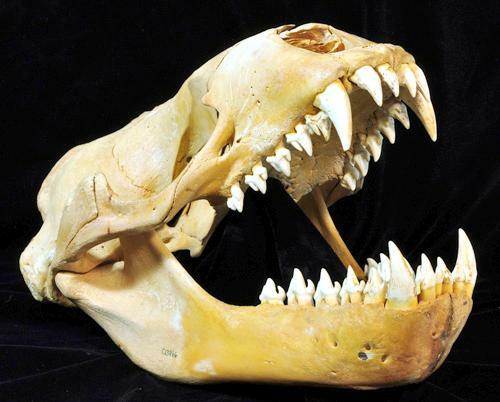 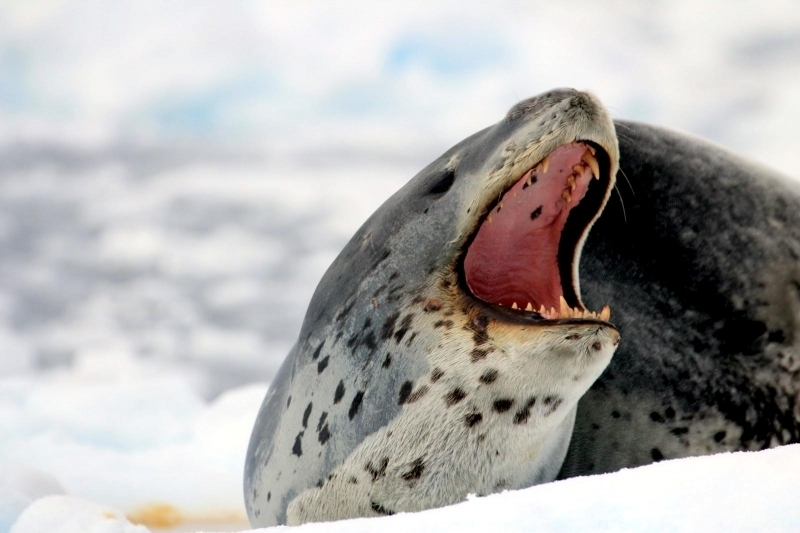 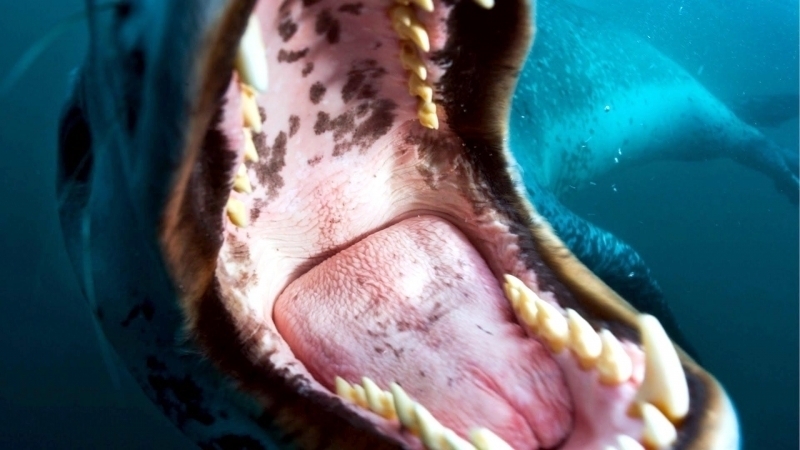 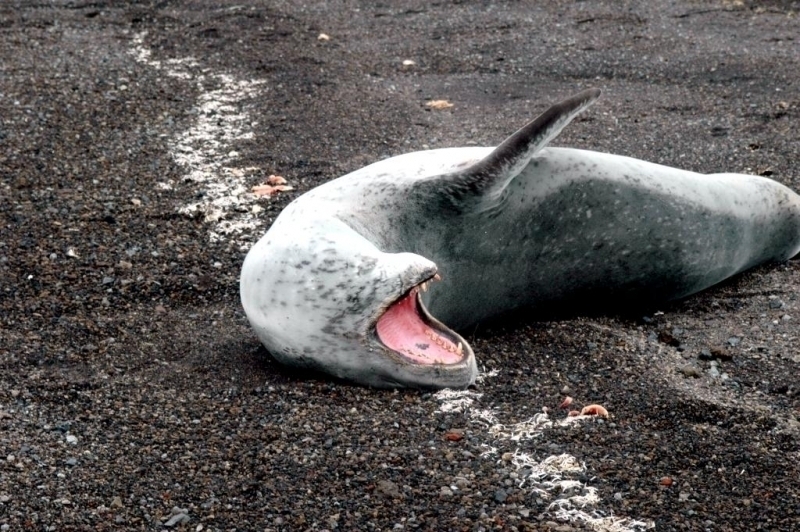 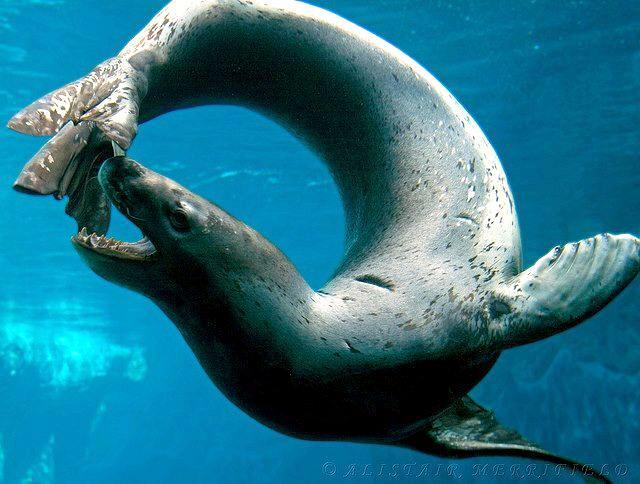 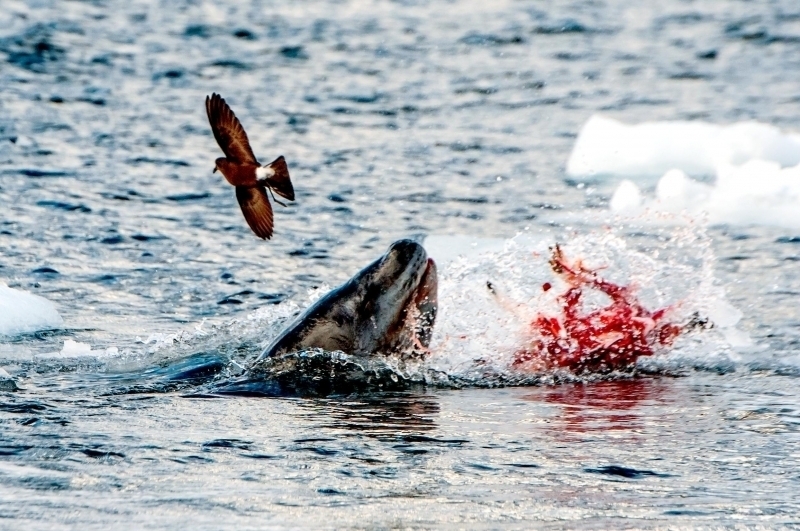 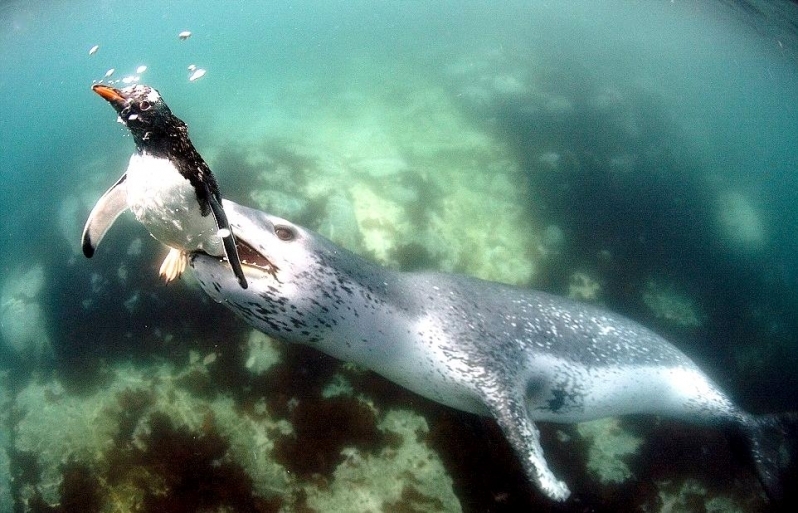 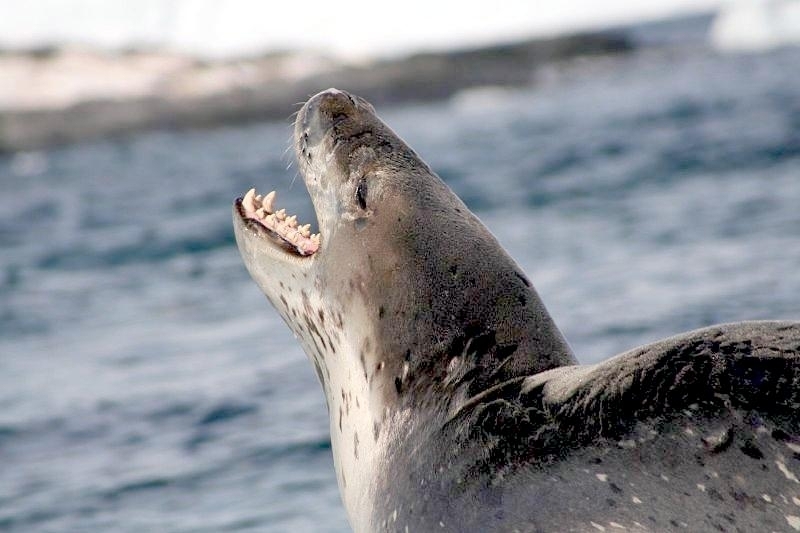 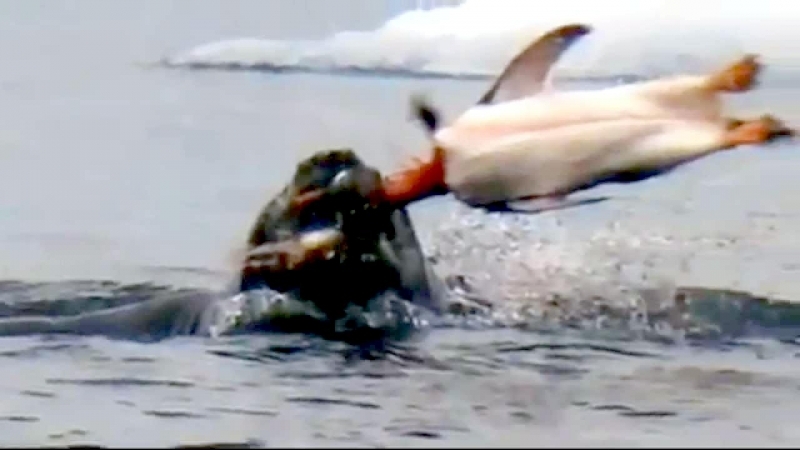 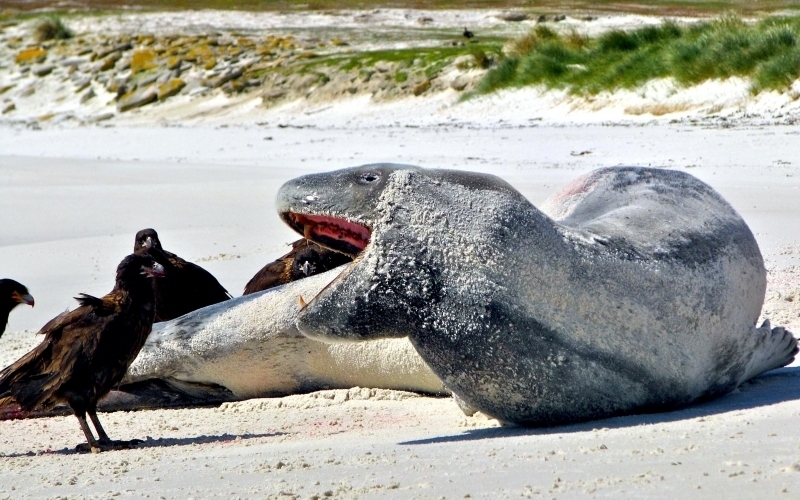 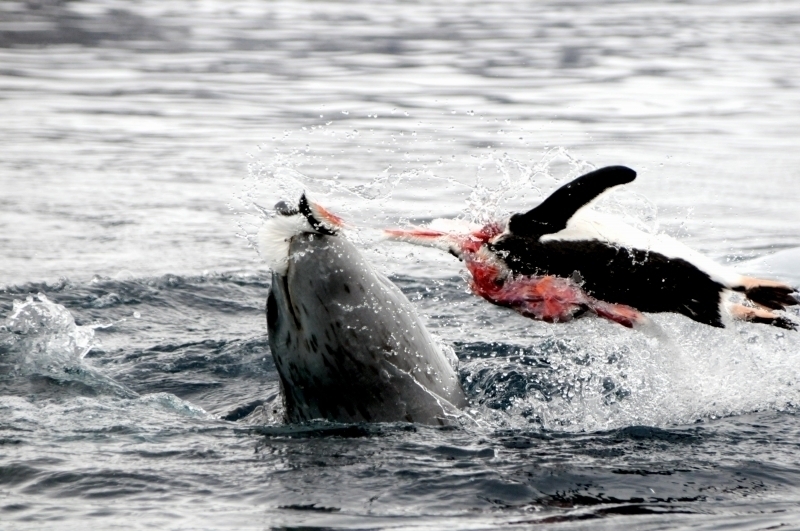 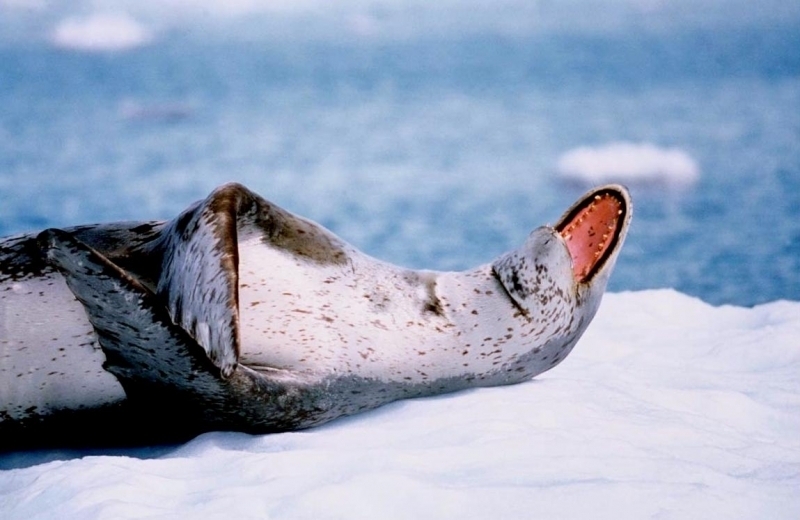 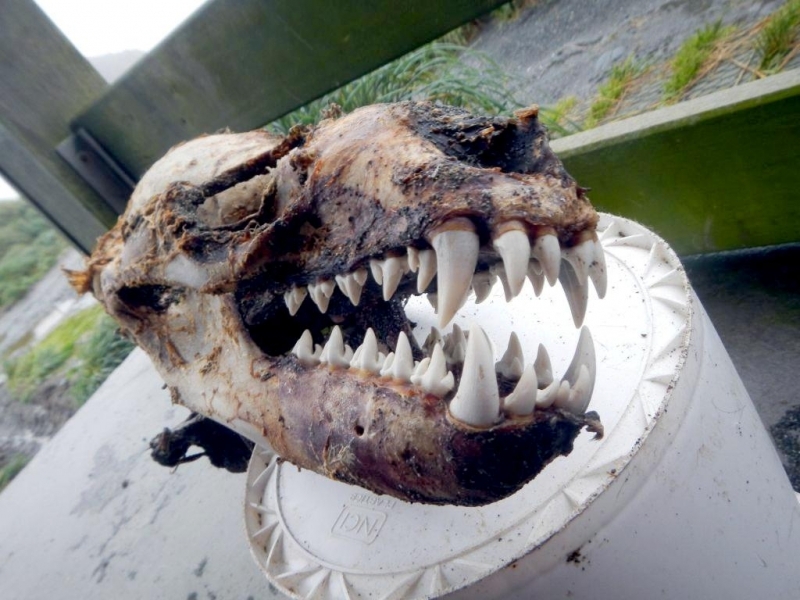 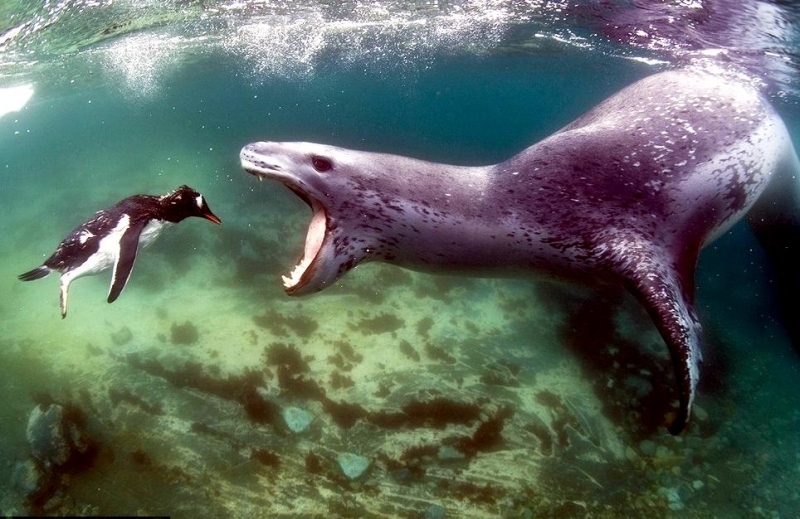 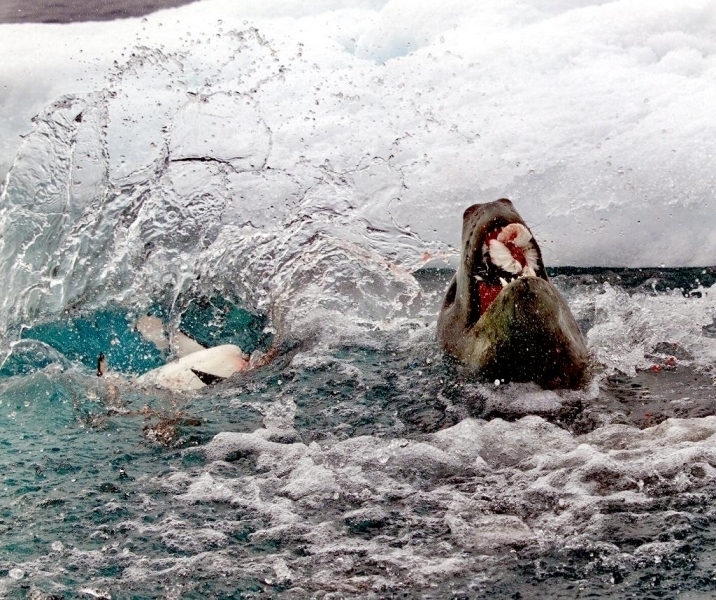 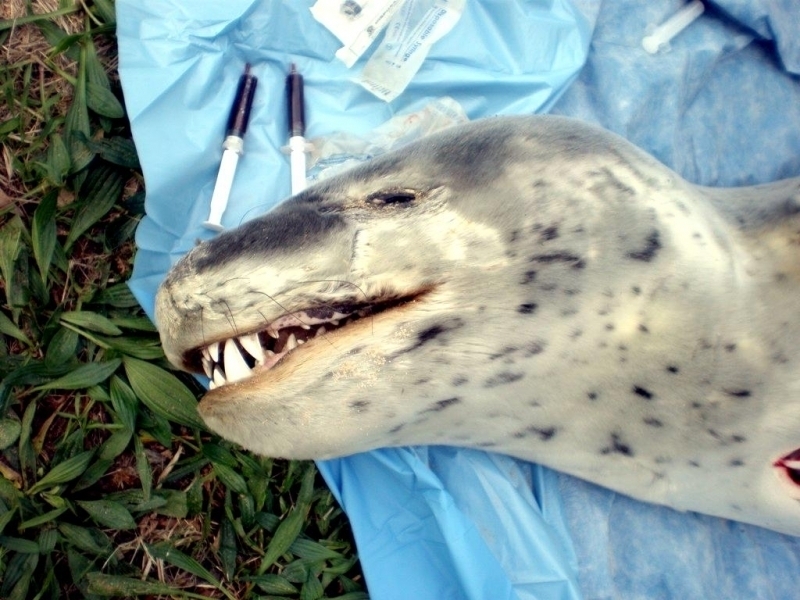 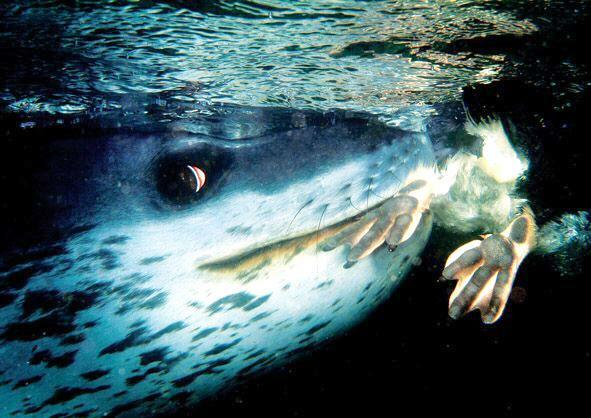 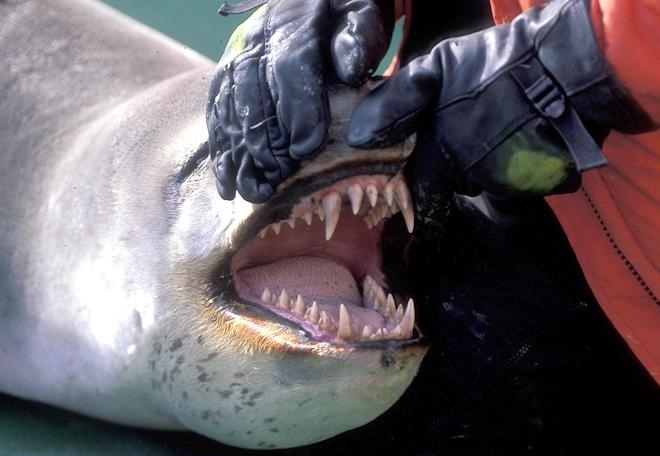 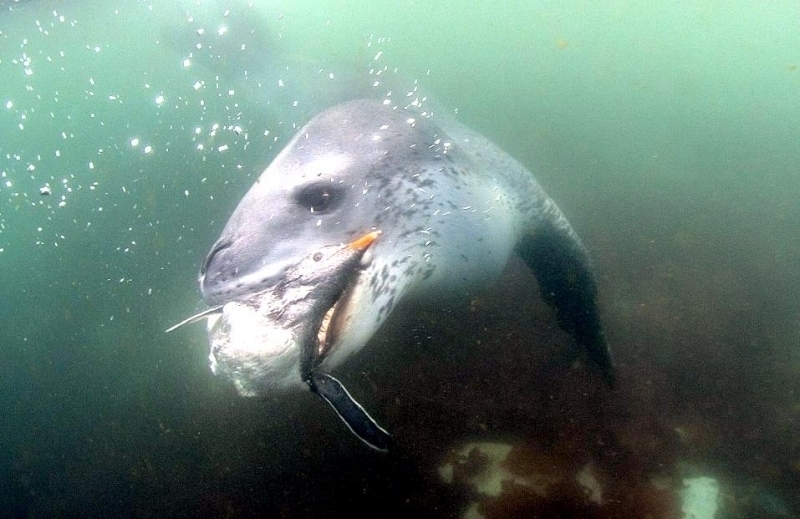 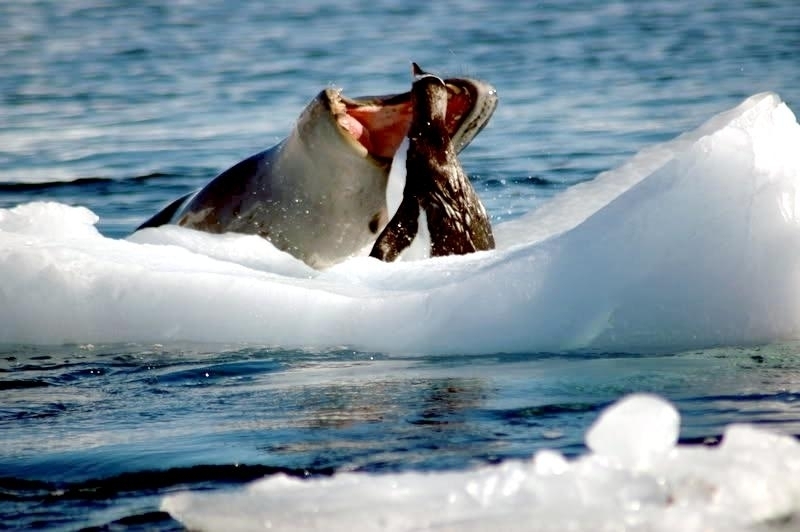 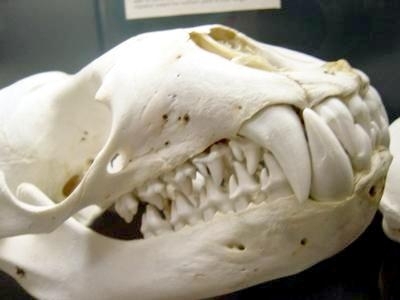 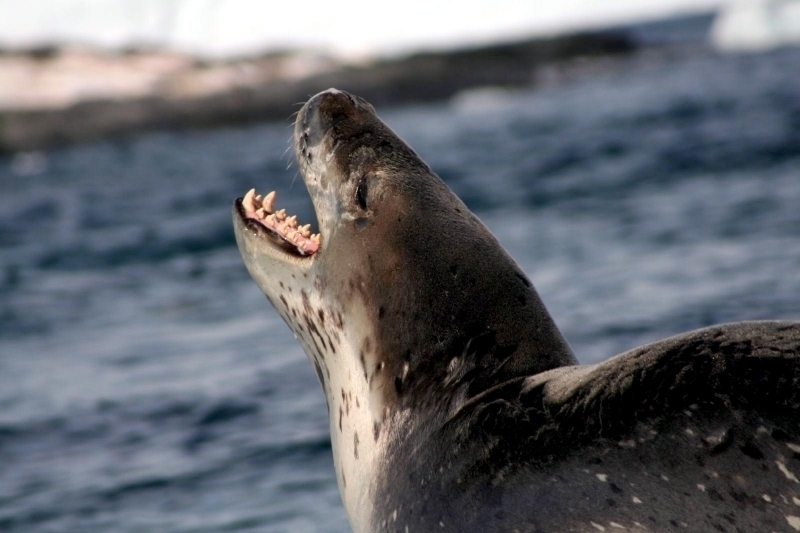 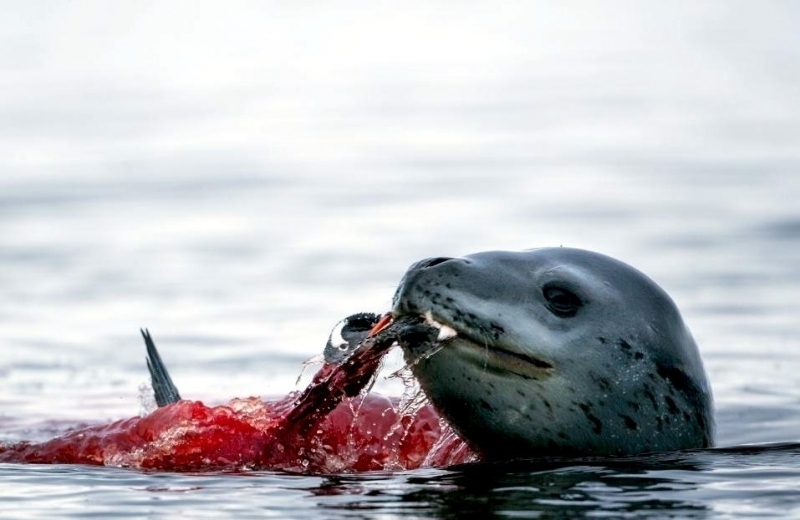 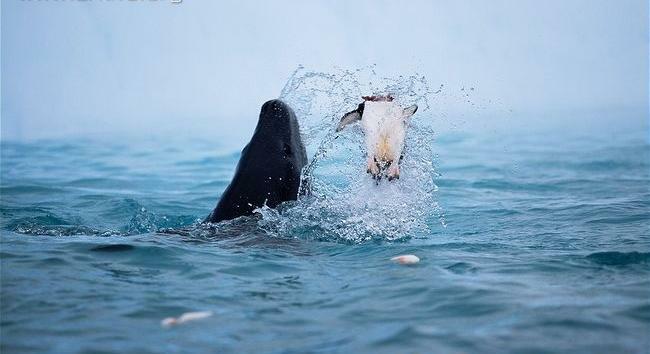 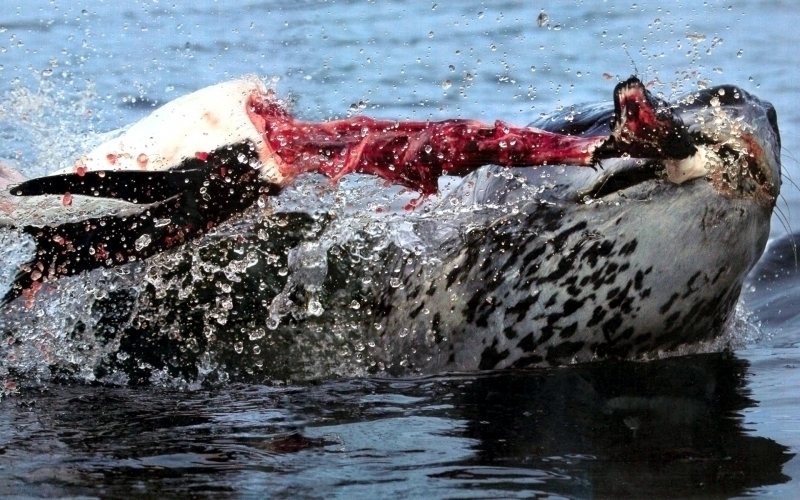 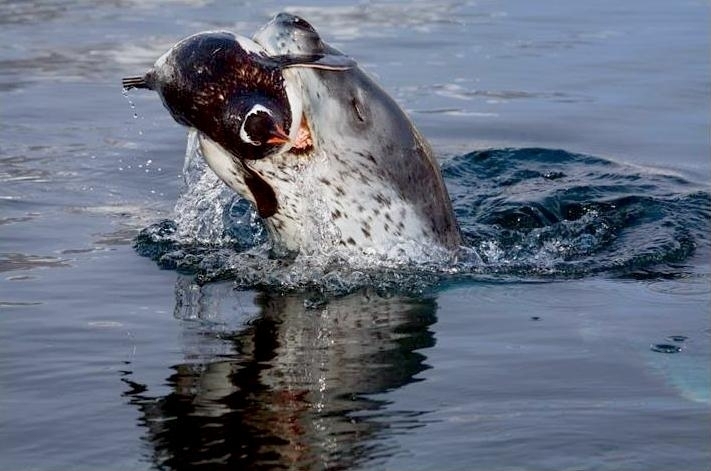 Leopard Seals eat a varied diet. 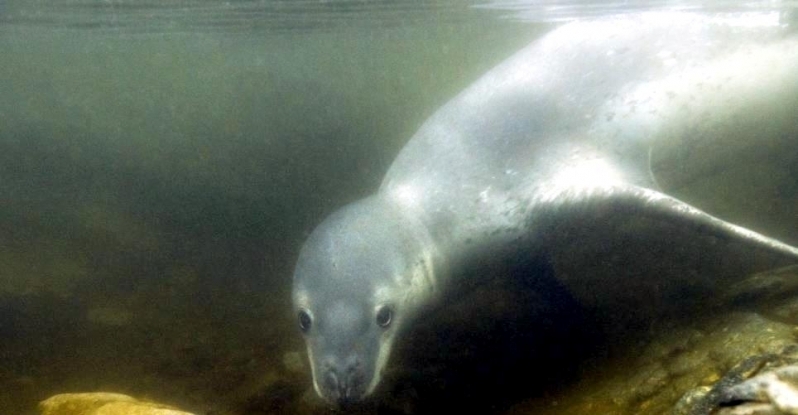 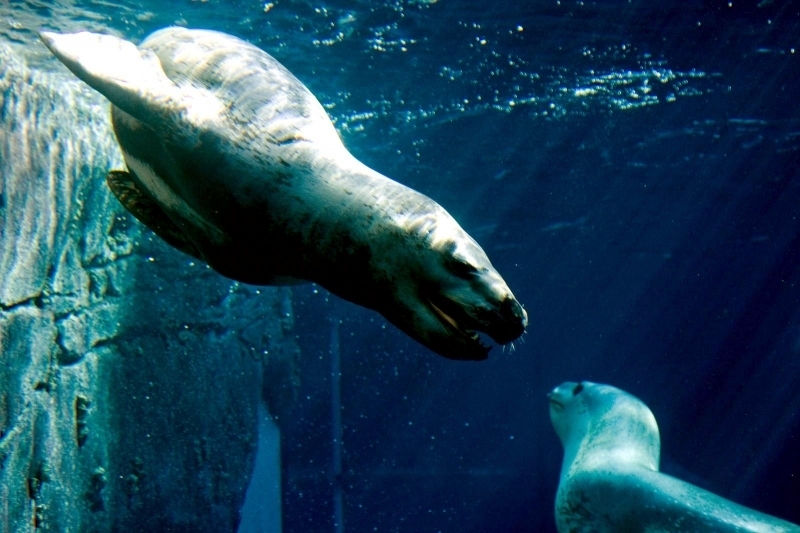 They are the only pinniped whose diet includes a significant amount of warm-blooded animals. 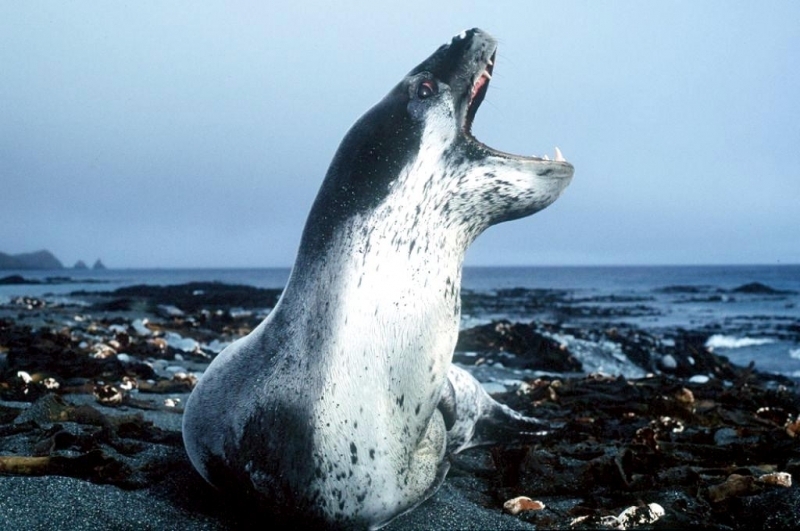 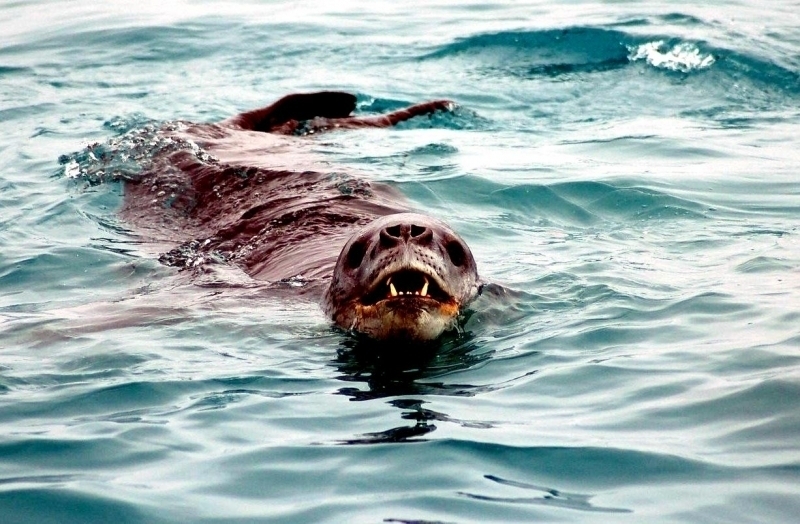 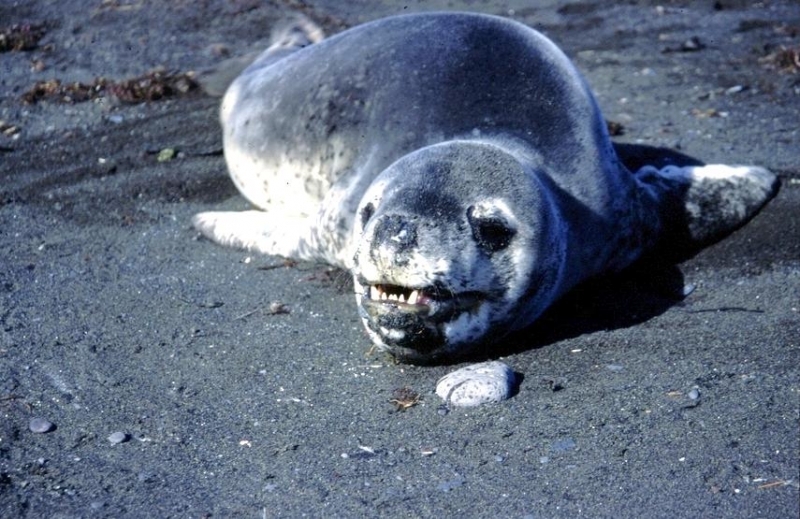 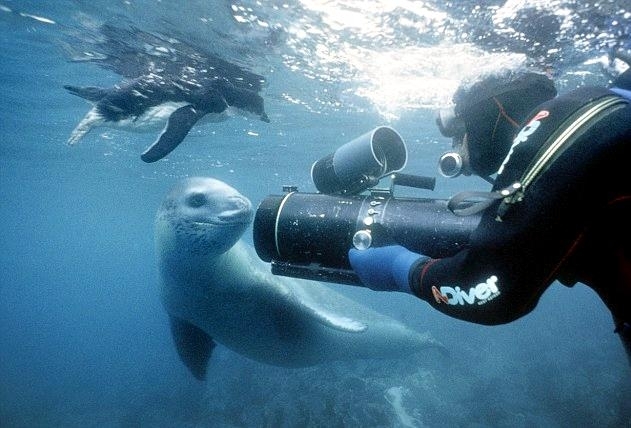 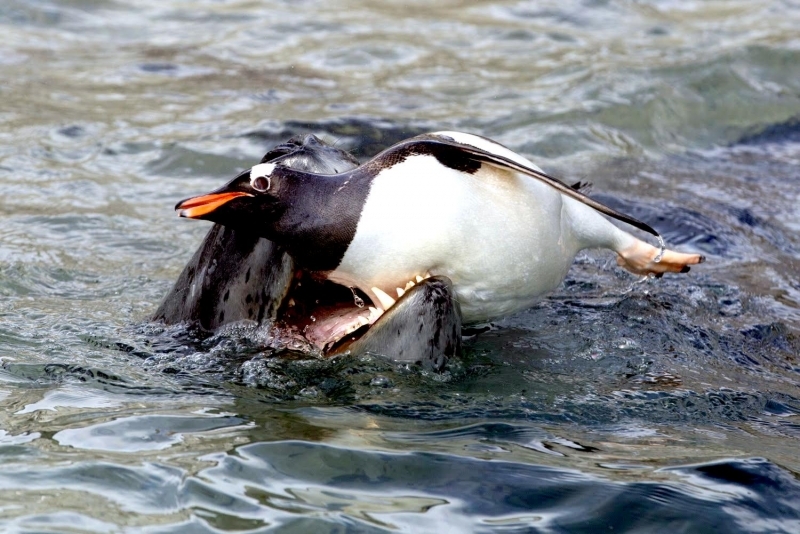 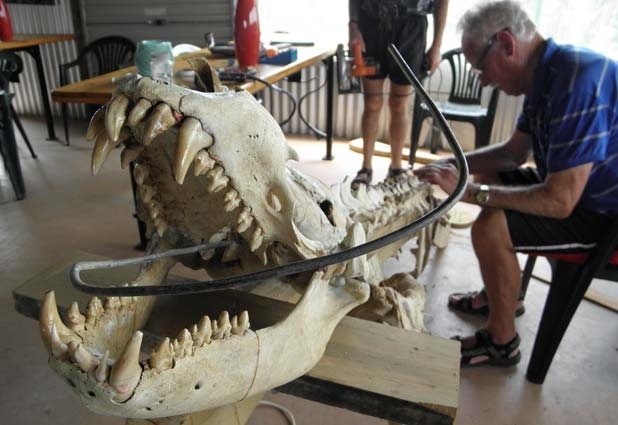 They have been known to attack Crabeater Seals and Southern Fur Seals. 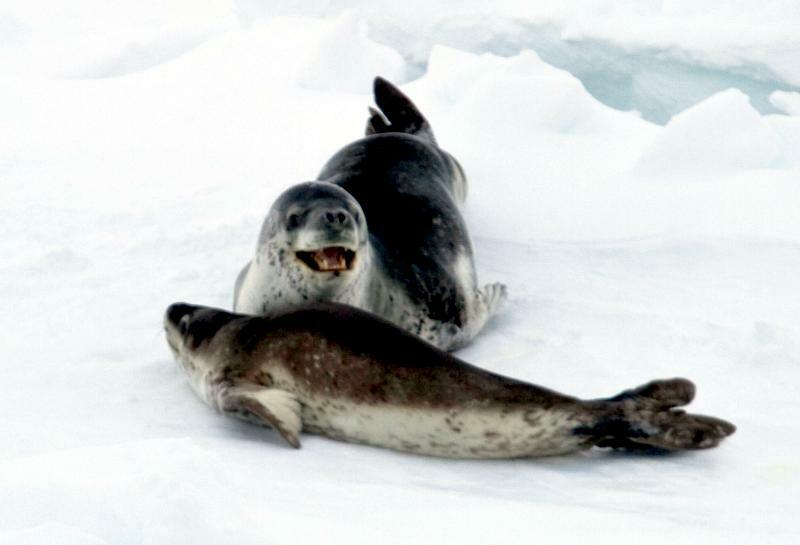 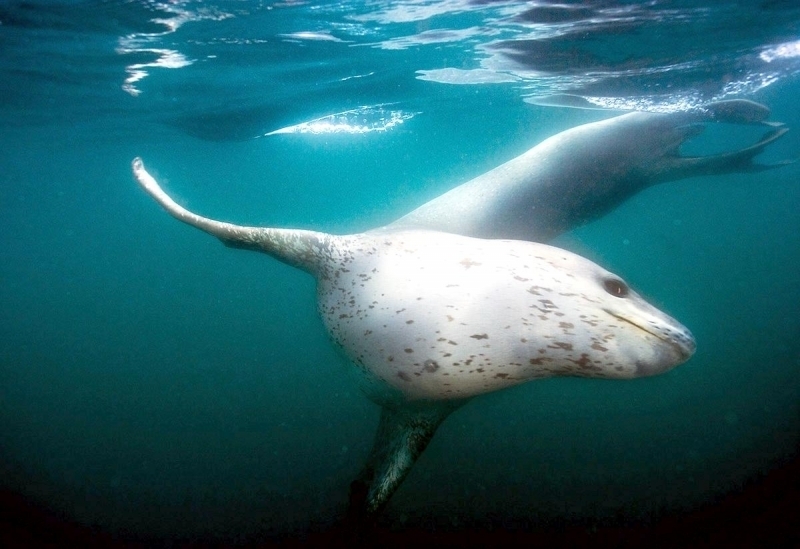 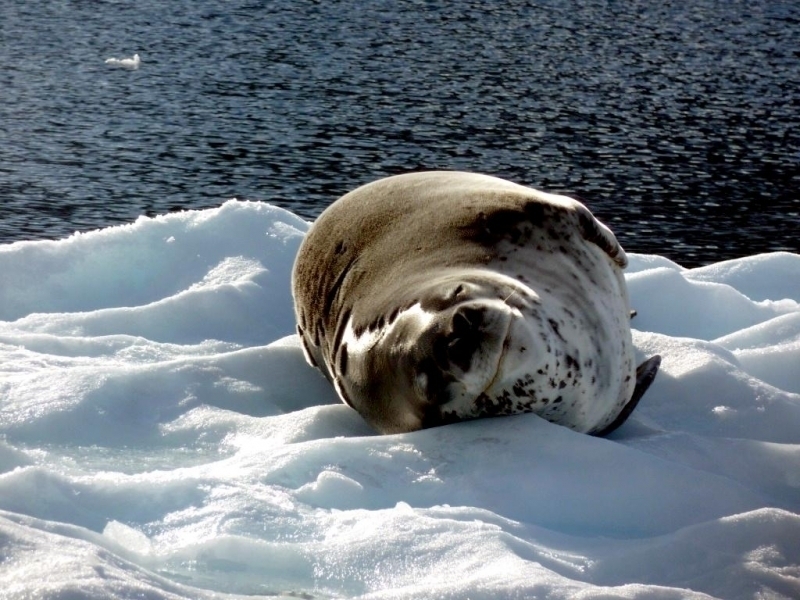 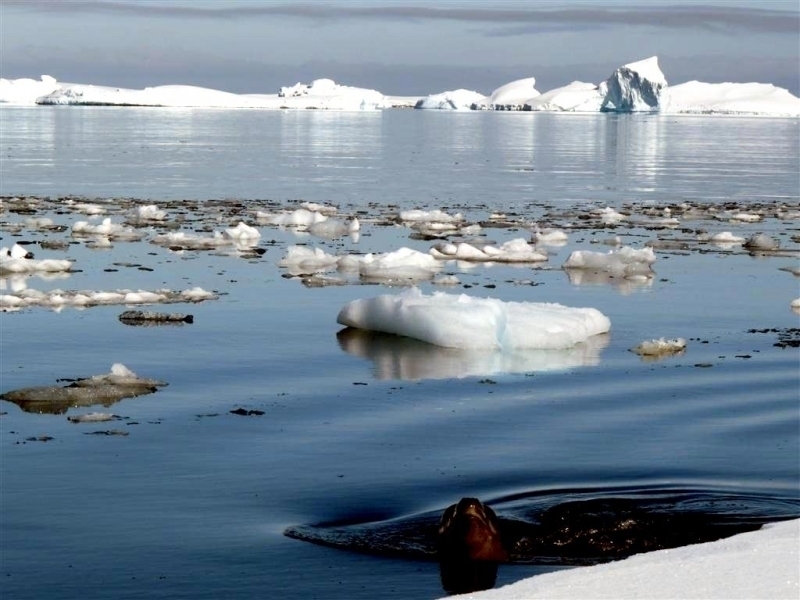 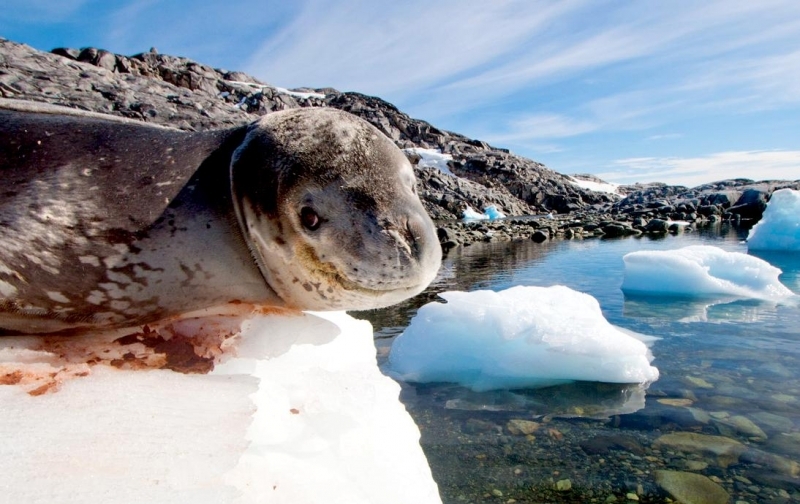 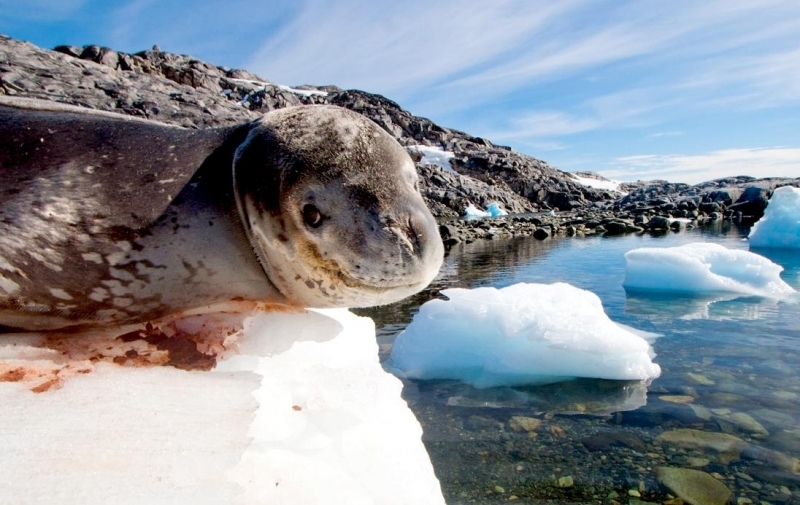 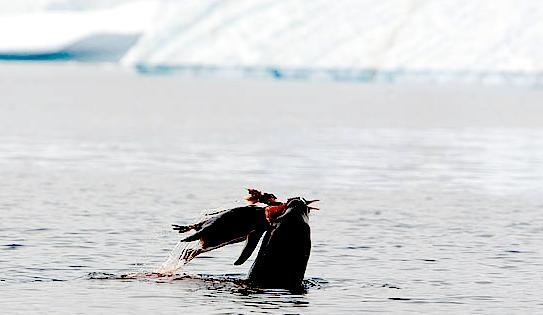 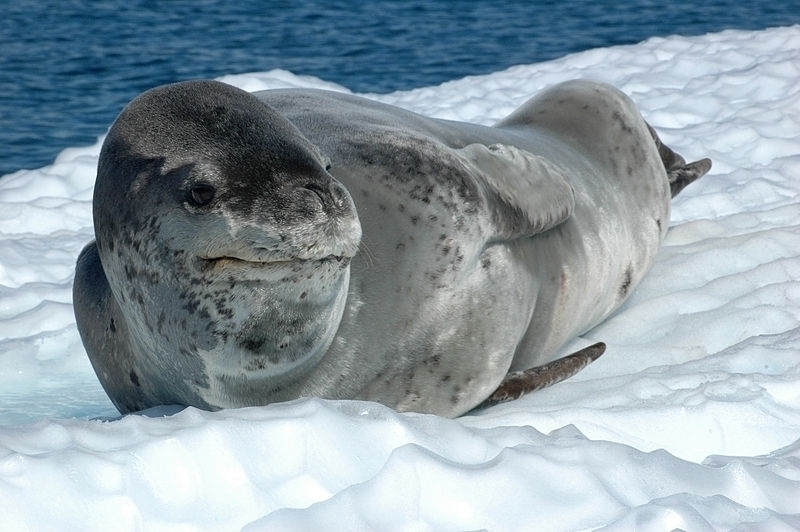 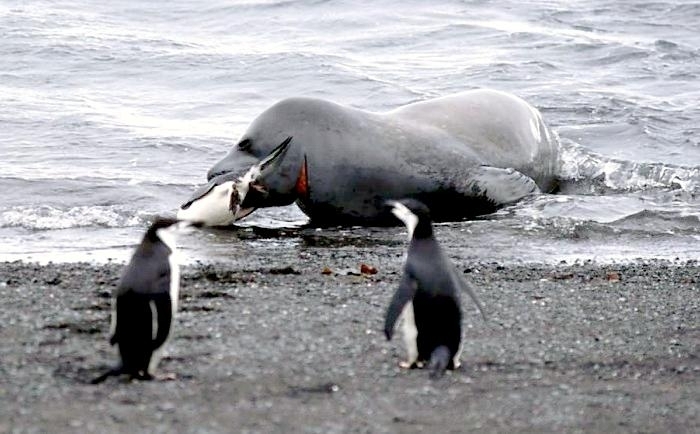 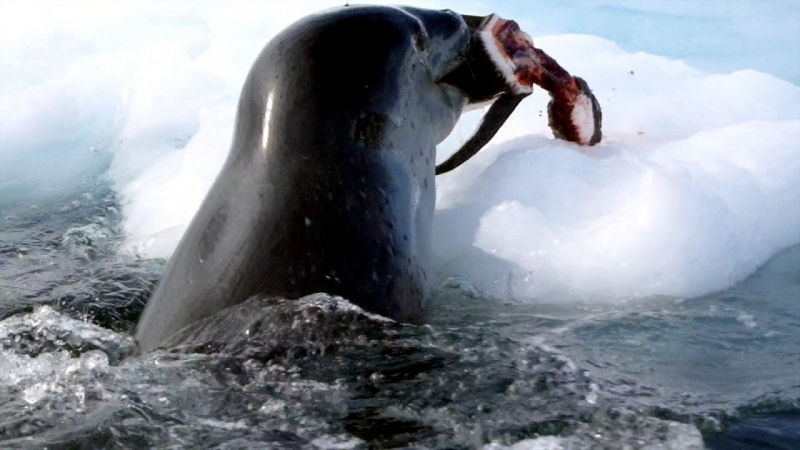 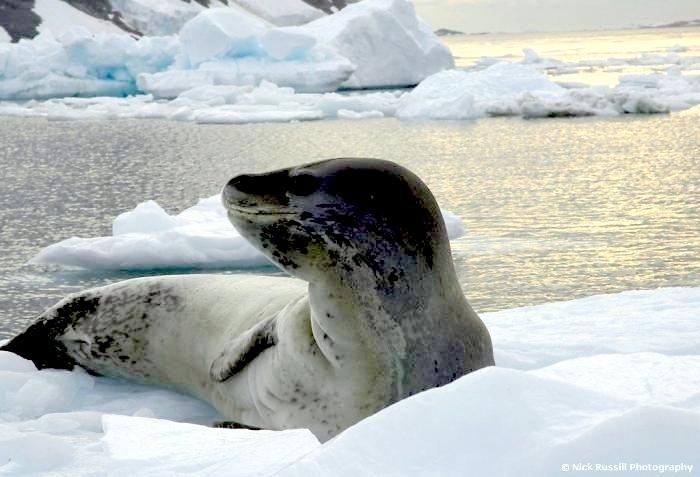 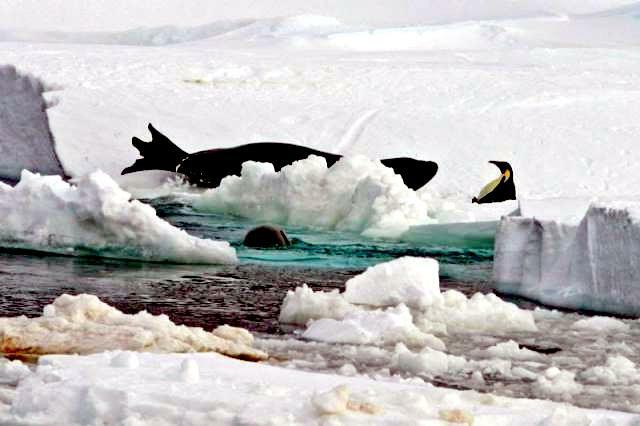 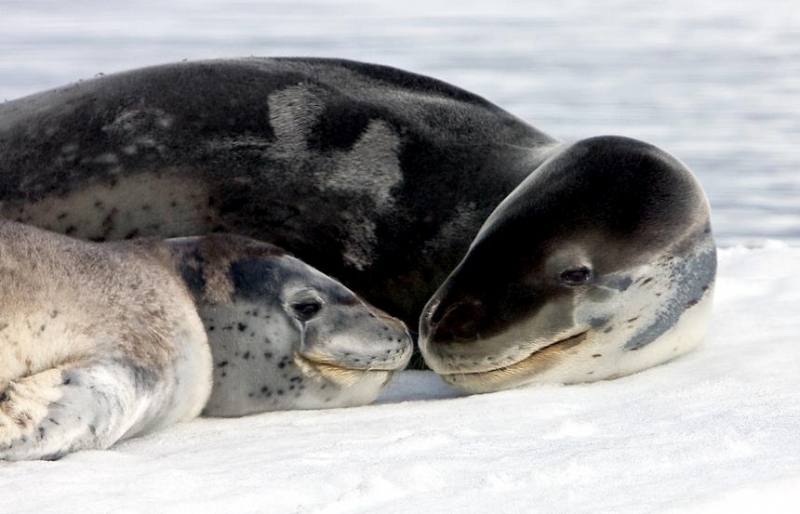 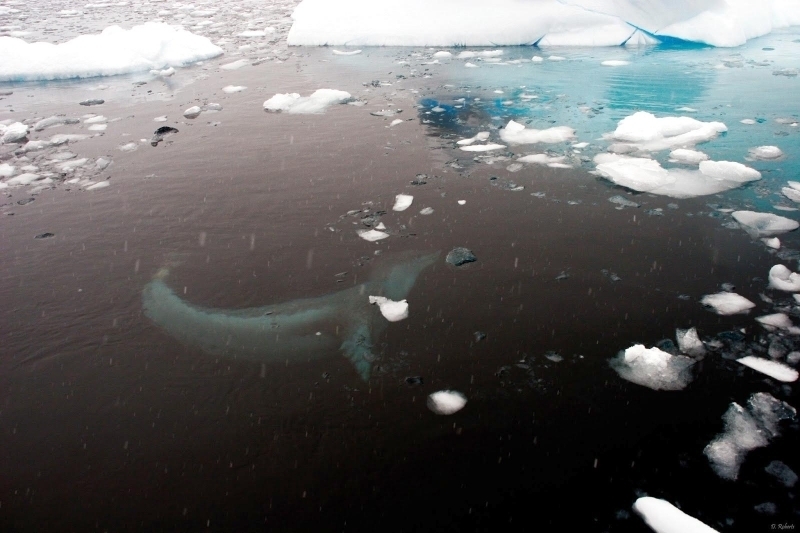 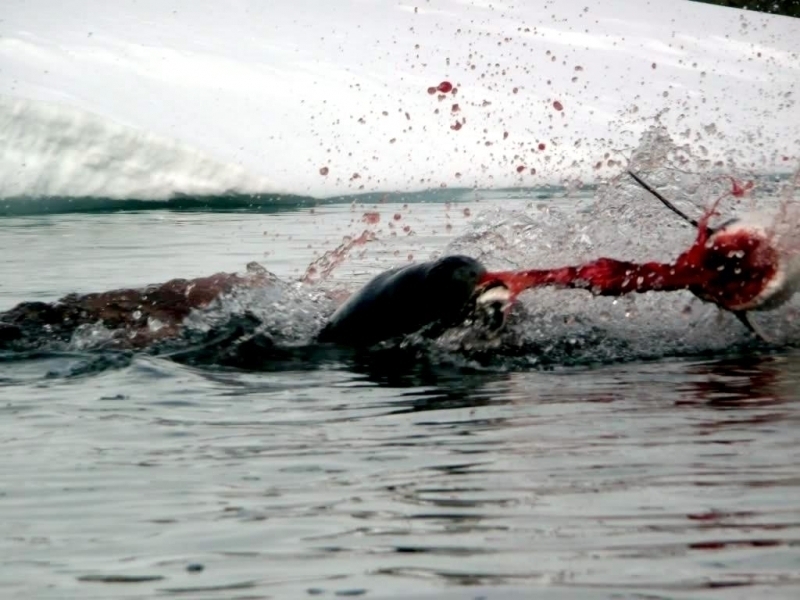 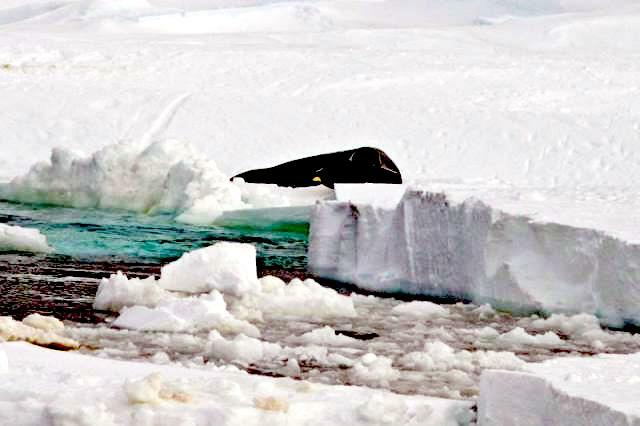 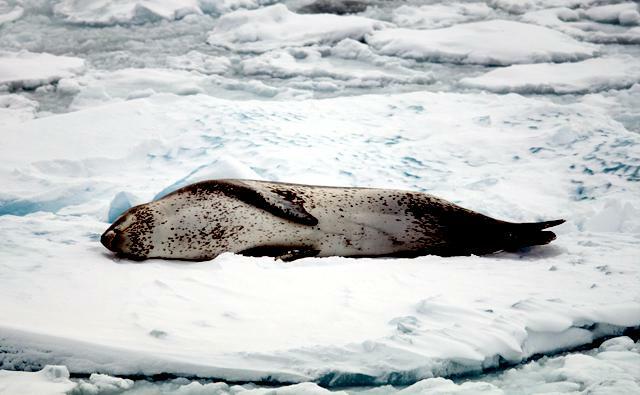 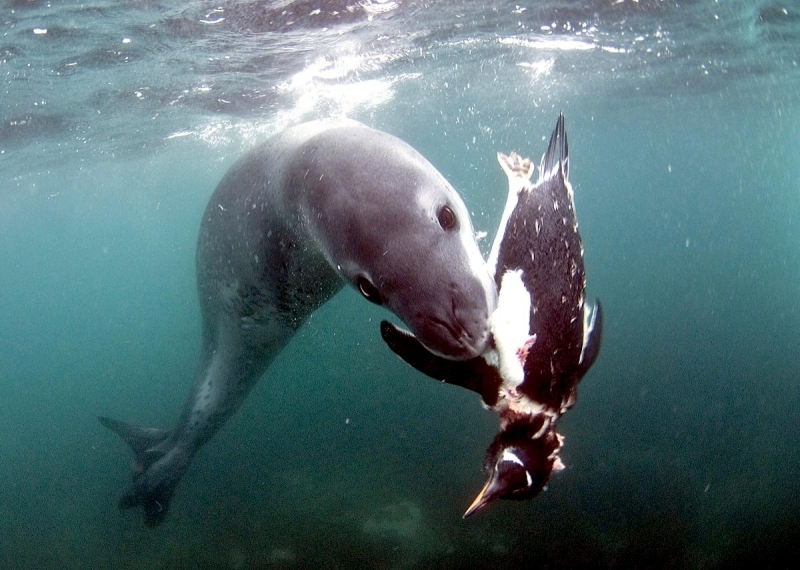 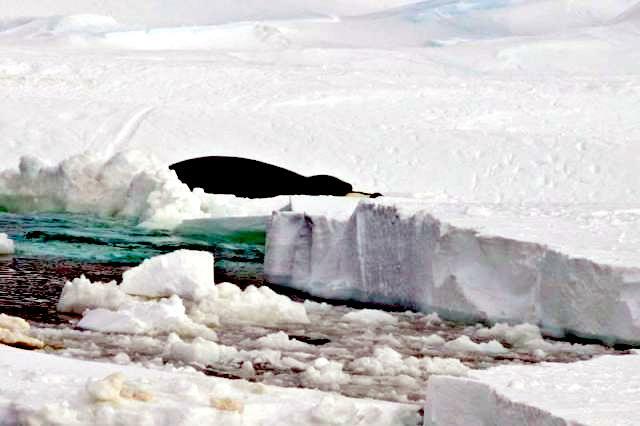 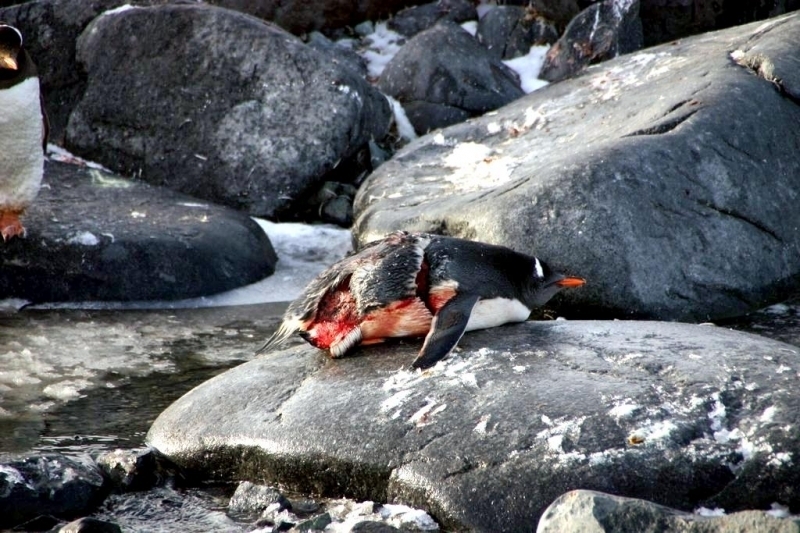 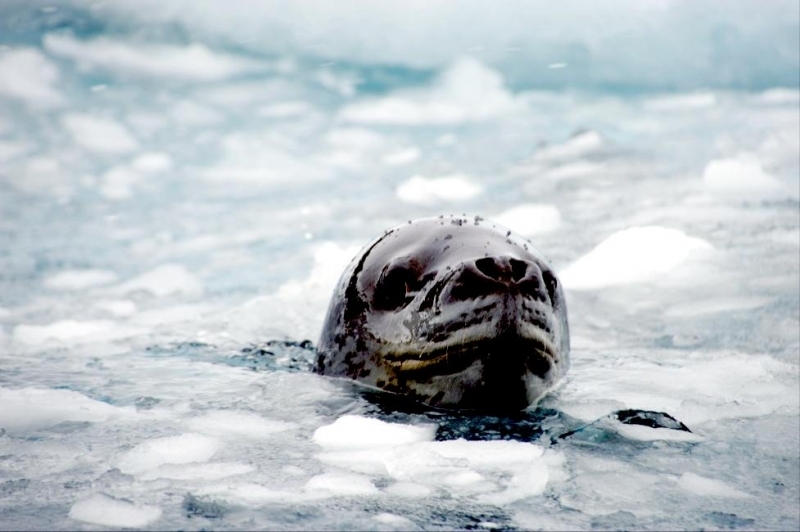 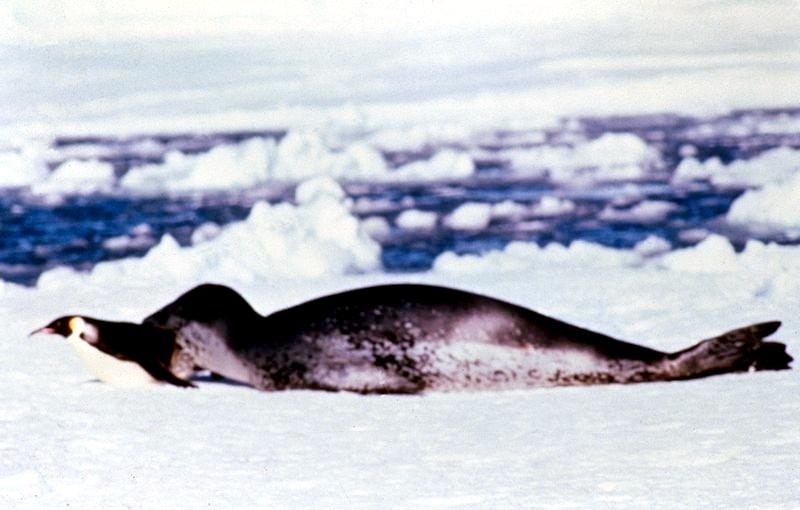 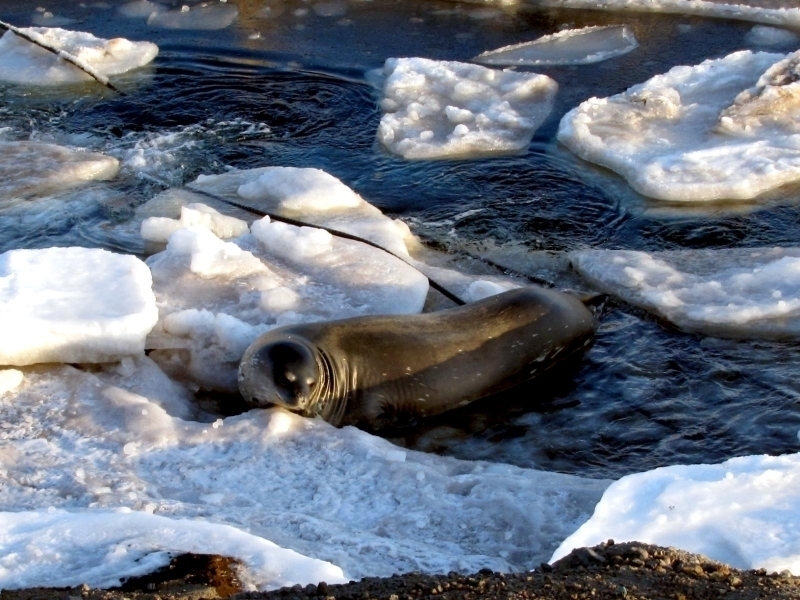 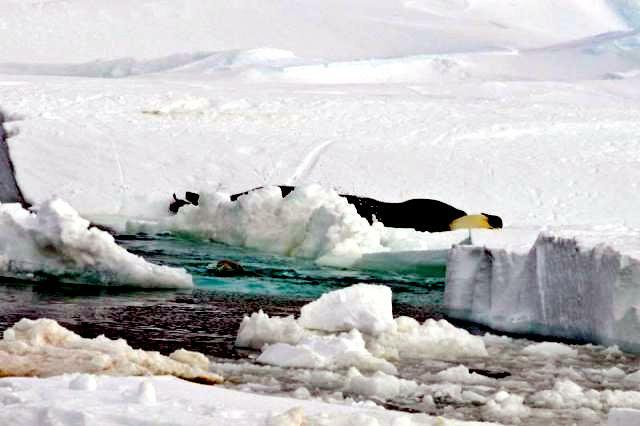 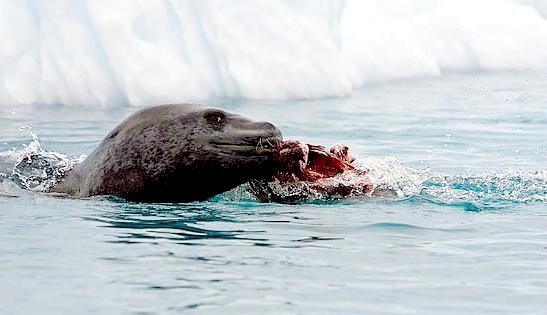 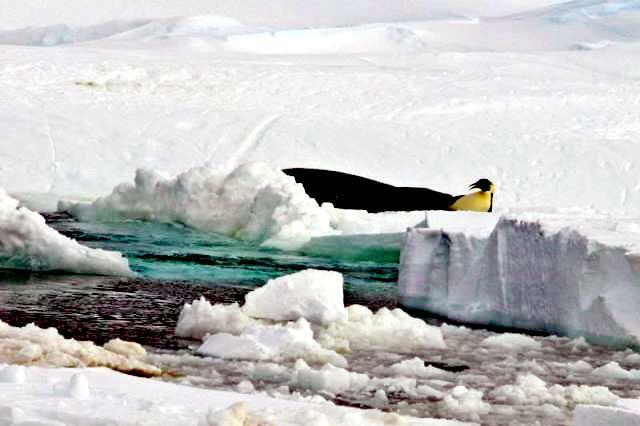 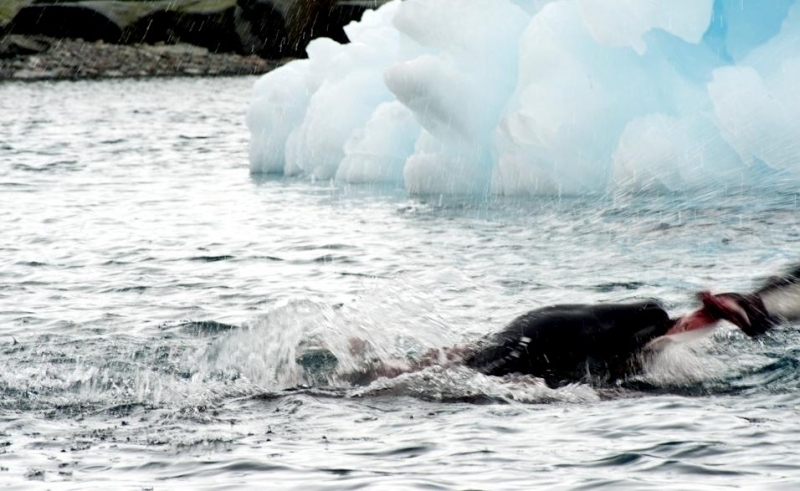 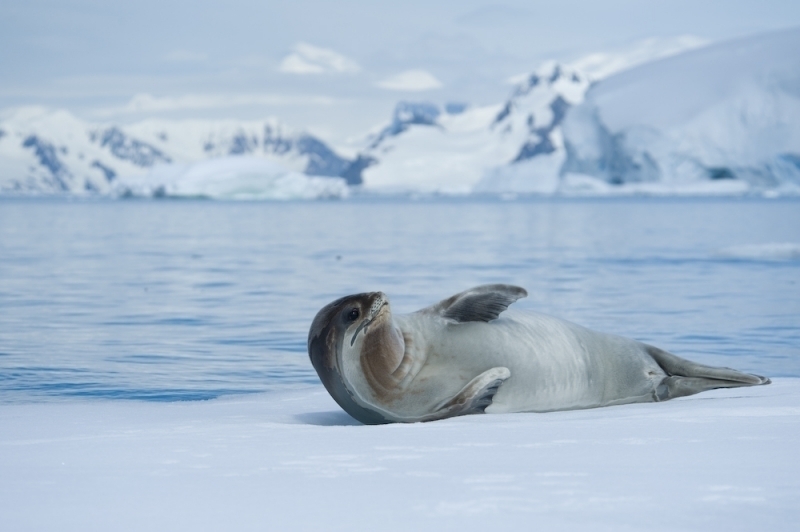 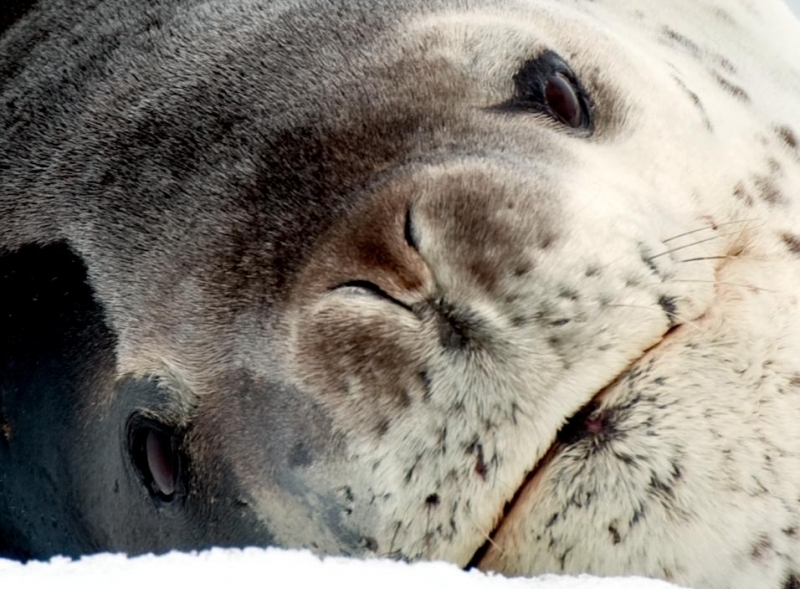 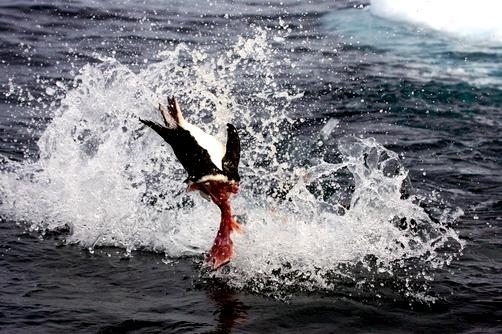 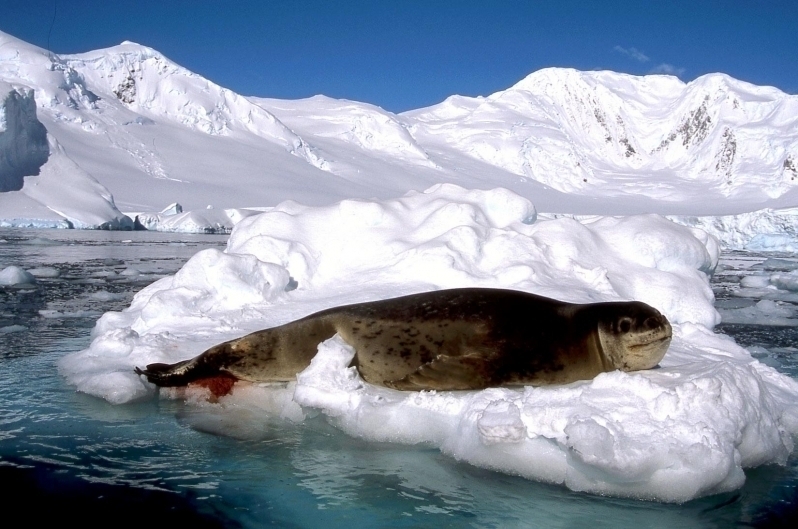 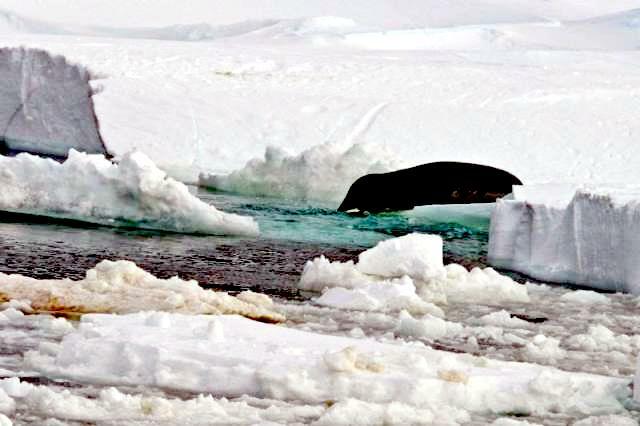 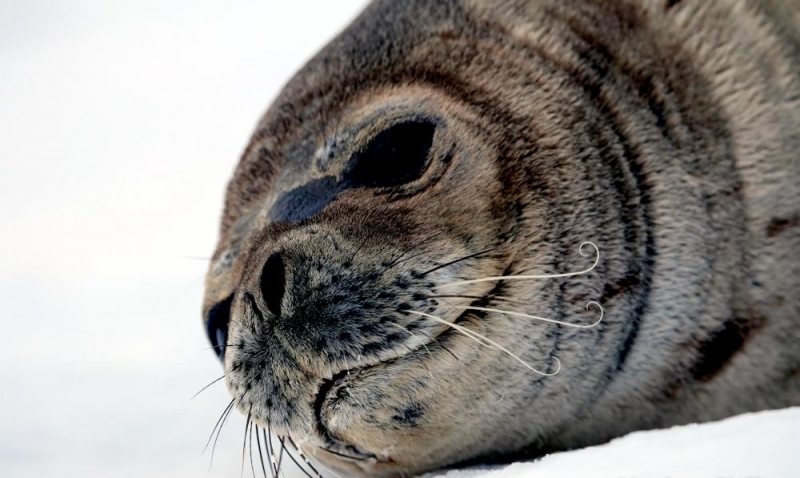 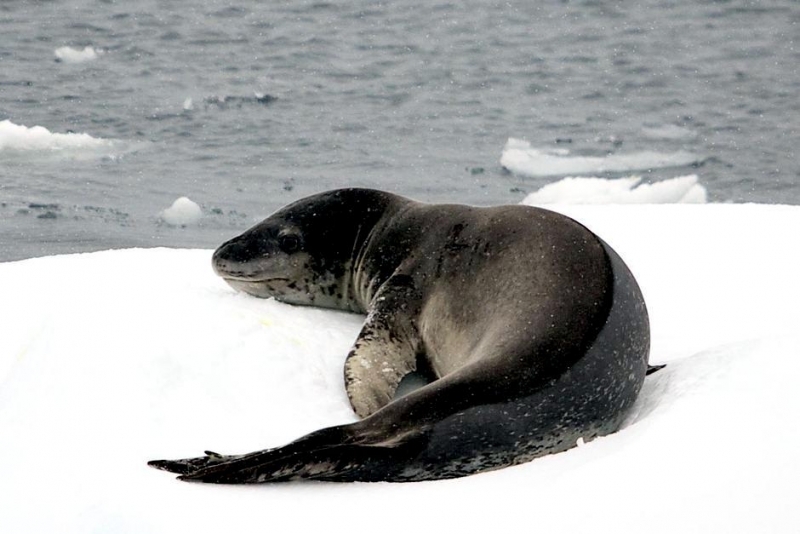 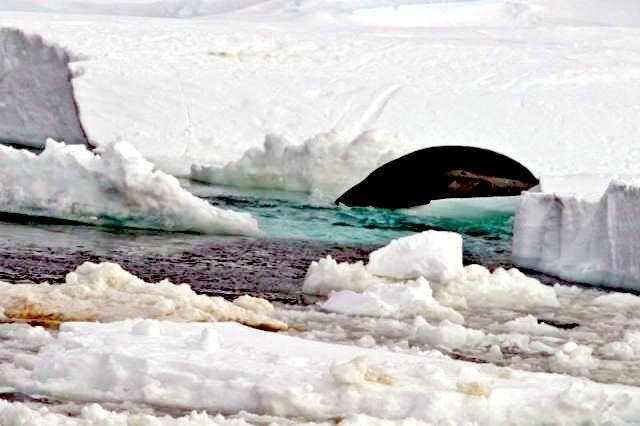 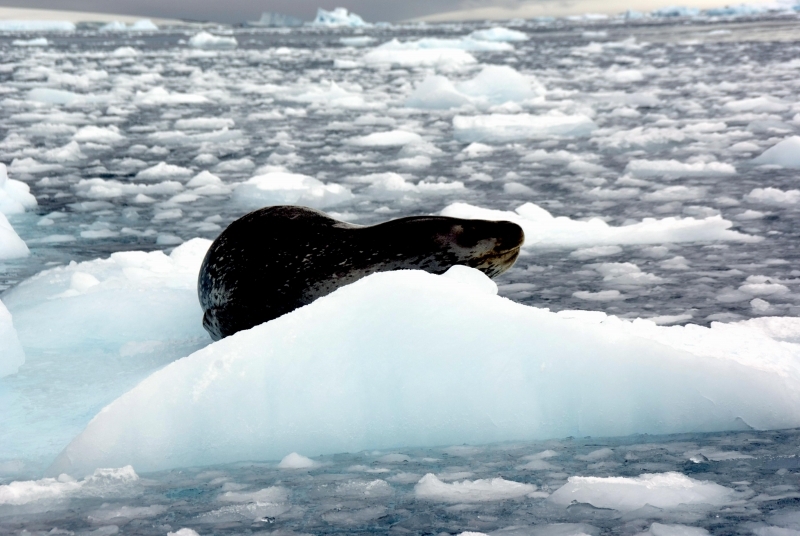 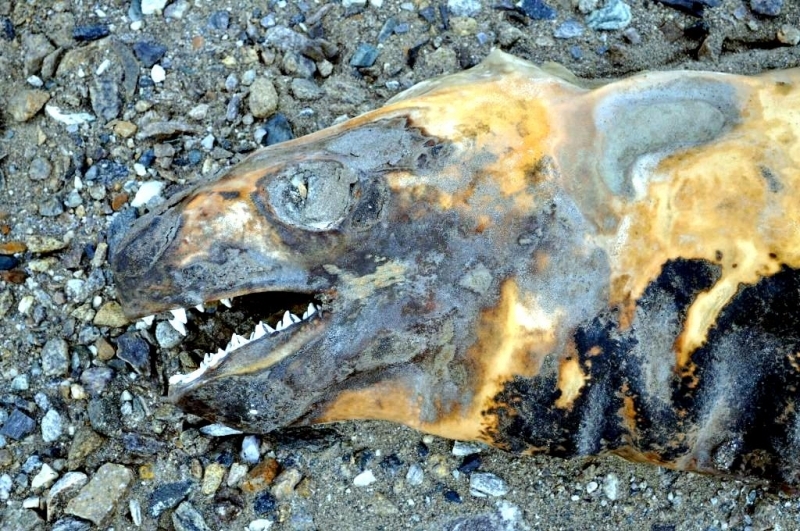 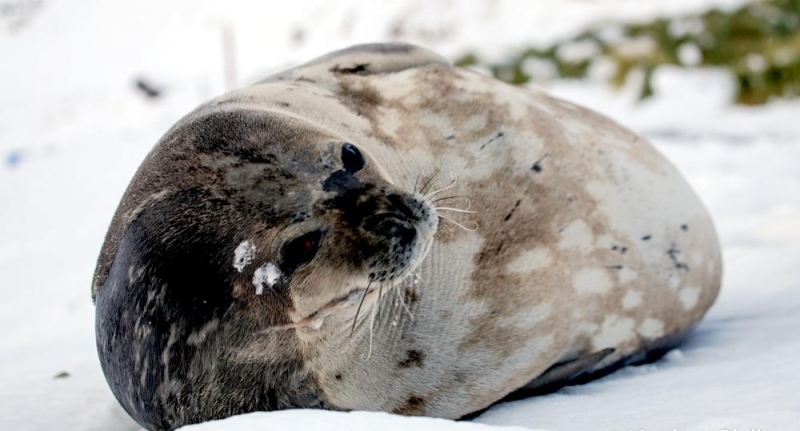 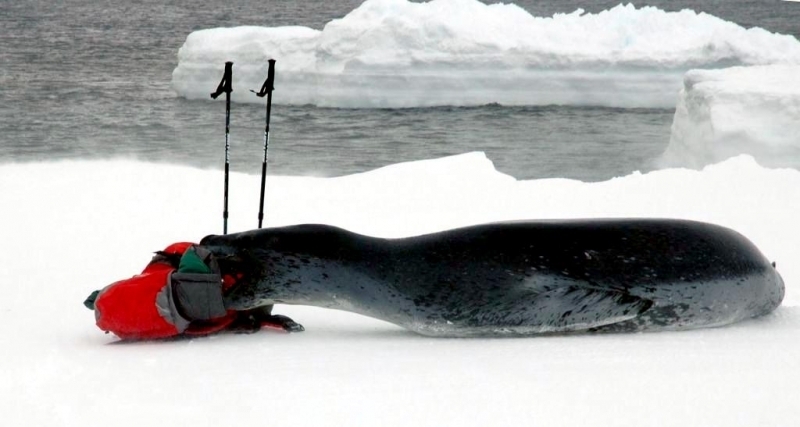 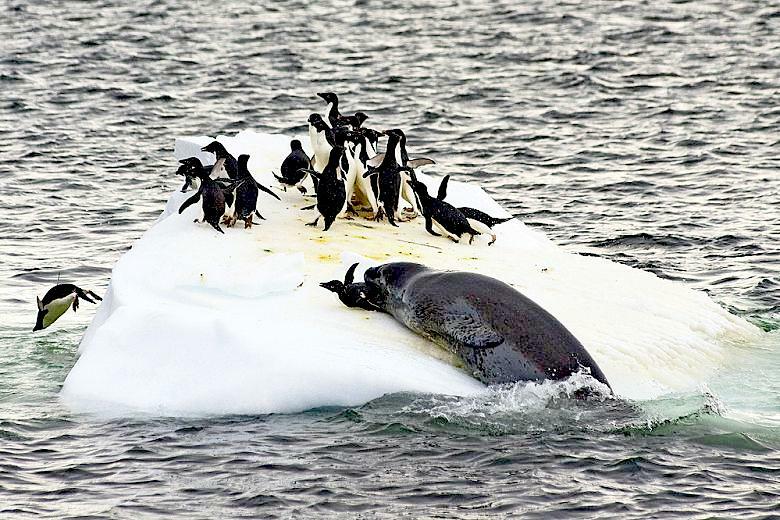 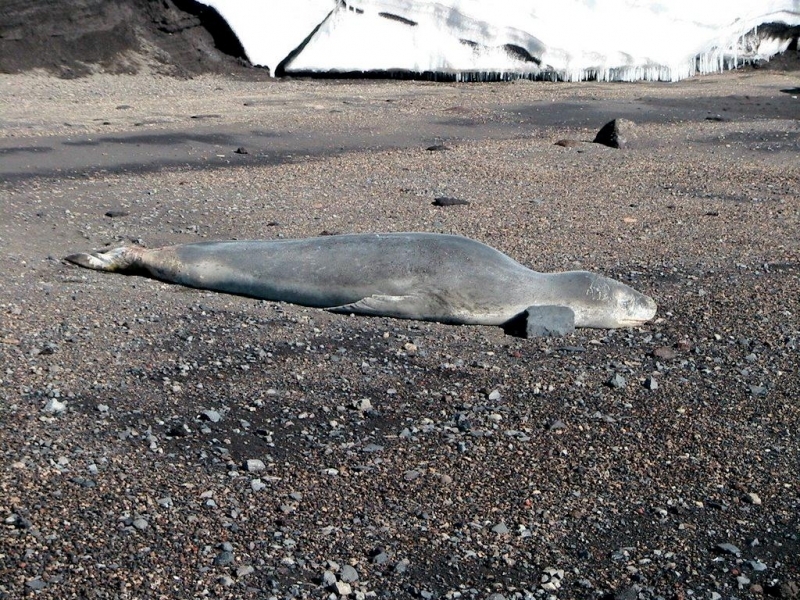 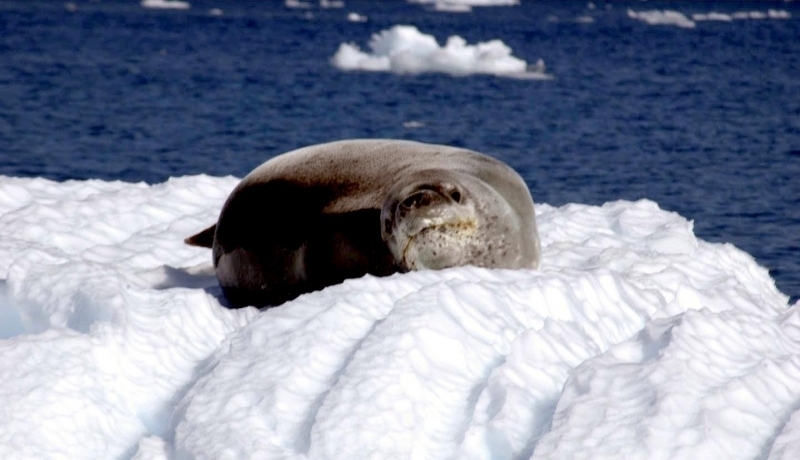 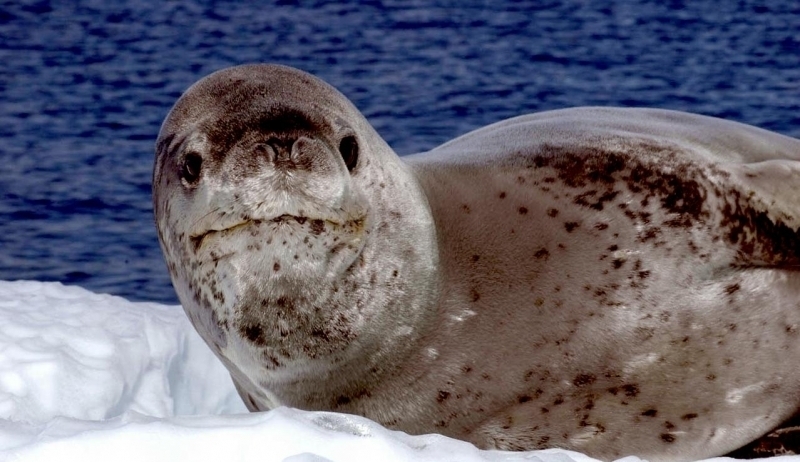 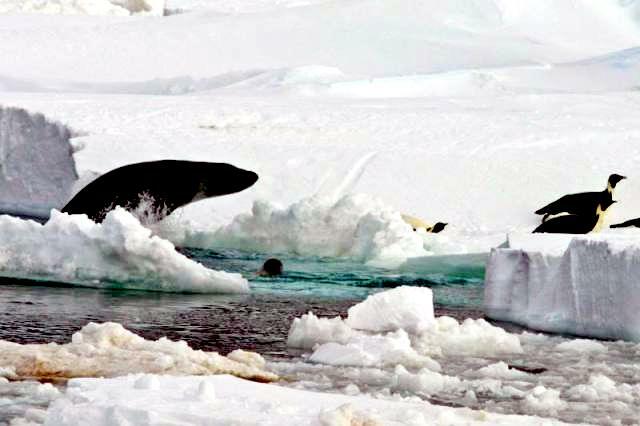 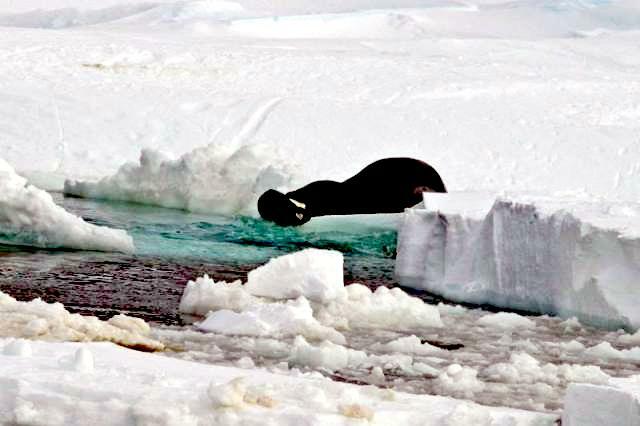 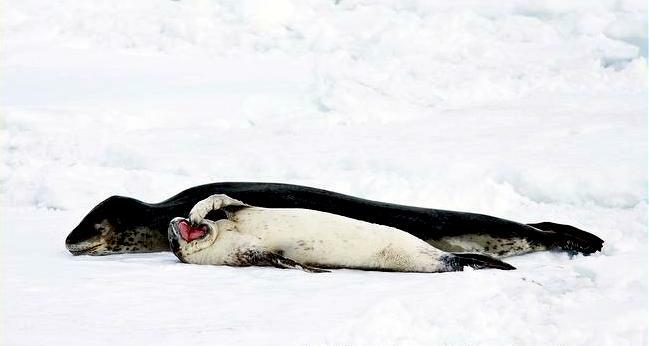 They prey on krill, other seals particularly young Crabeater Seals, various penguin species, fish and cephalopods. 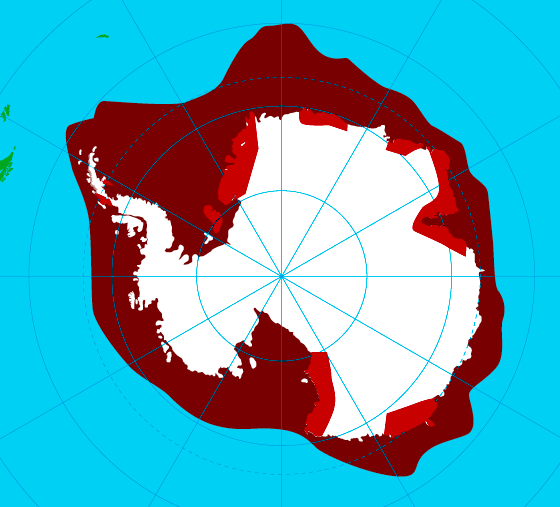 Proportions vary according to age and availability. 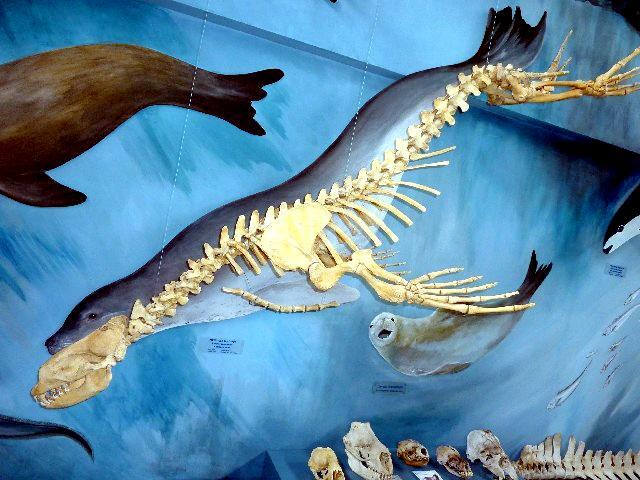 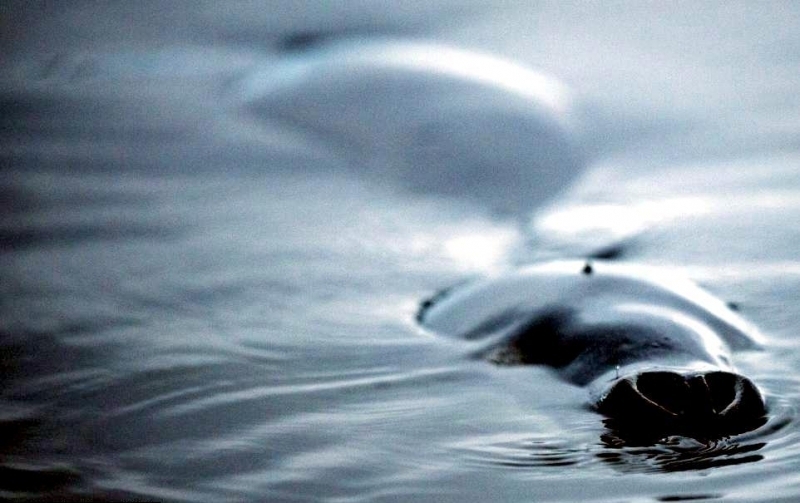 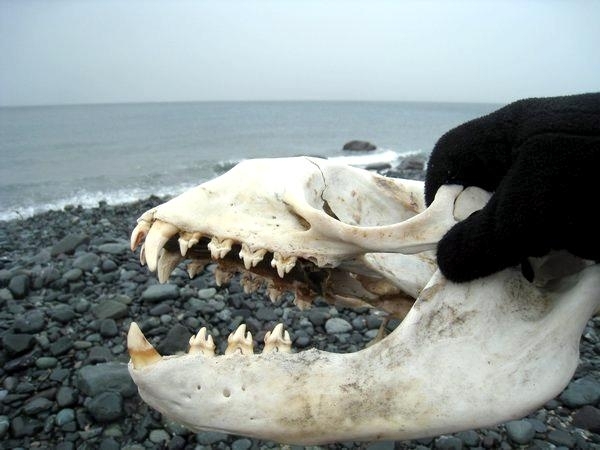 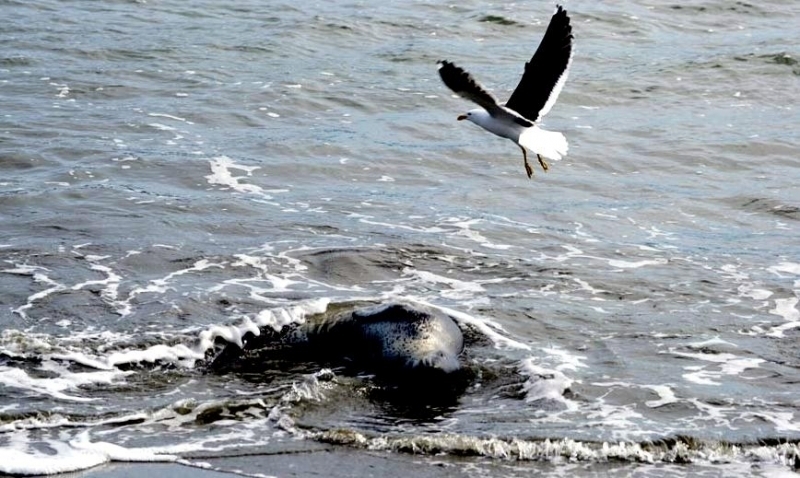 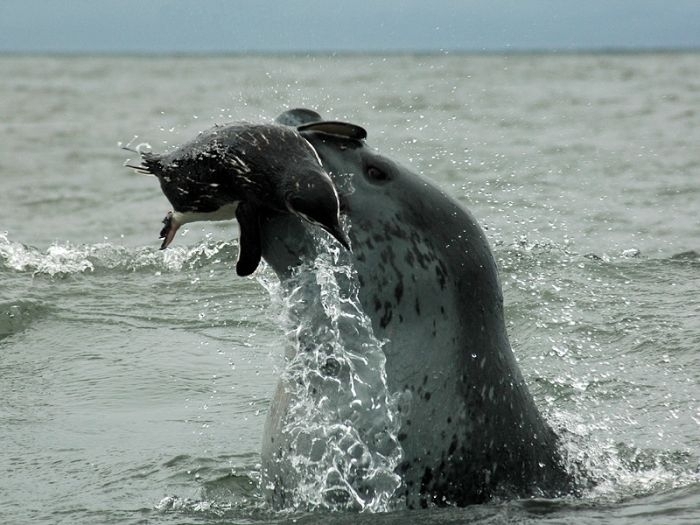 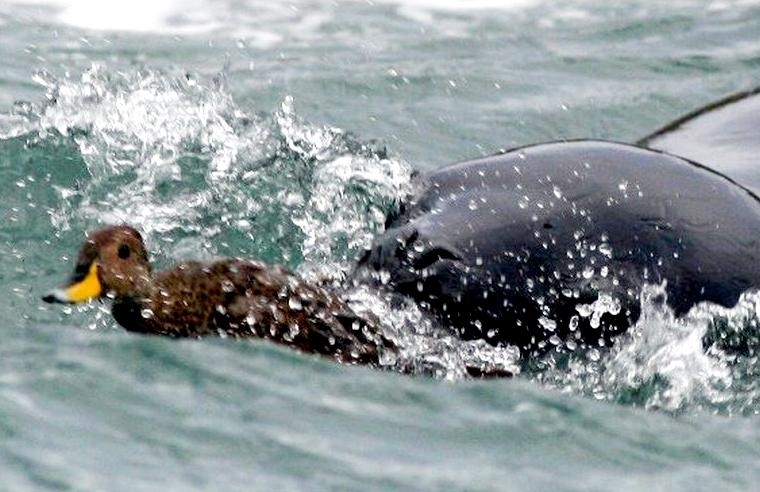 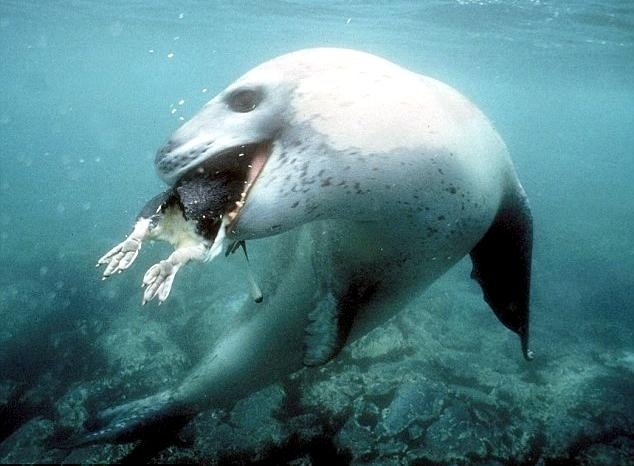 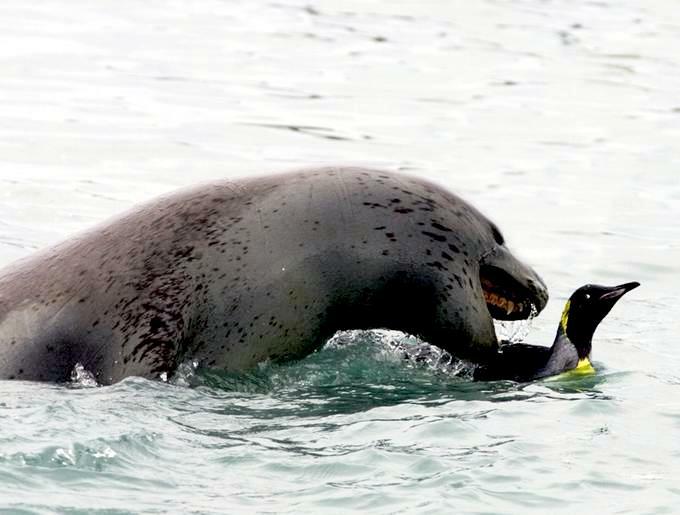 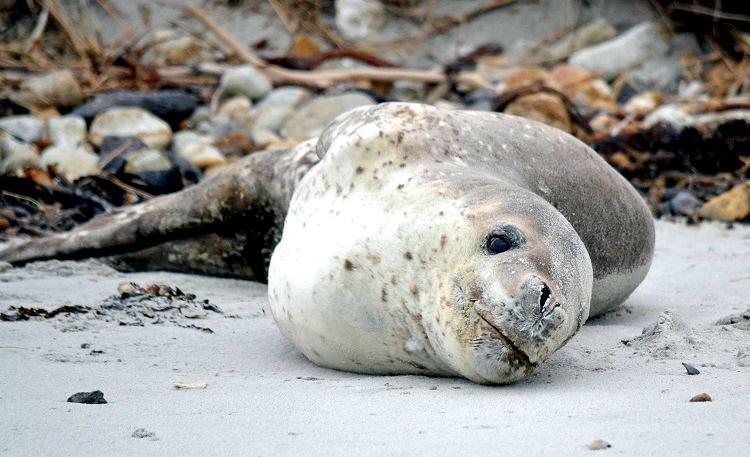 Like other seals, they are also known to scavenge the carrion of whales and other seals. 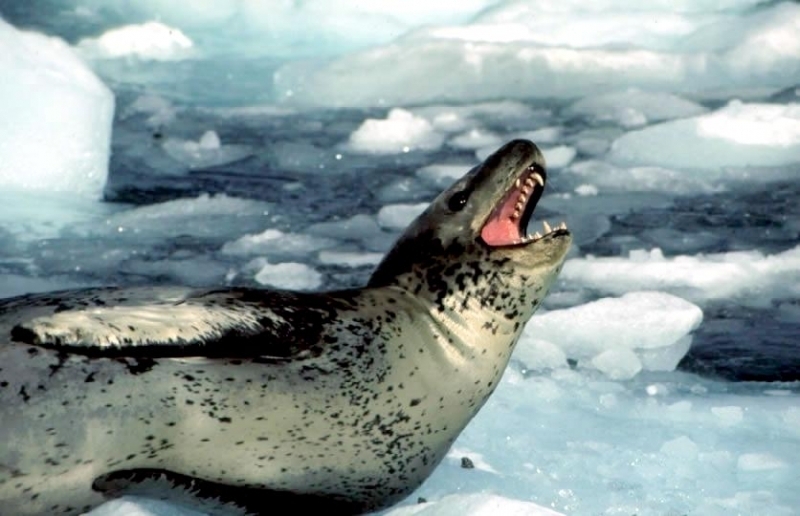 Leopard Seals can dive up to 15 minutes, however because their diet includes warm-blooded animals they are not deep diving seals. 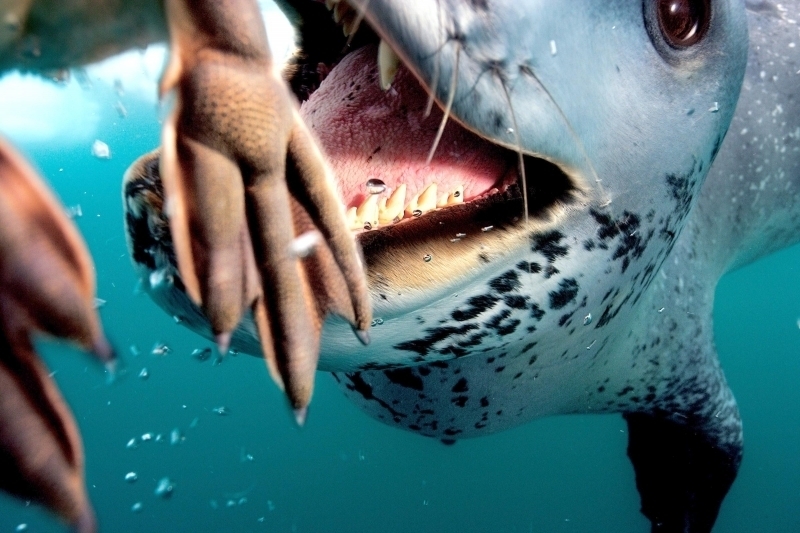 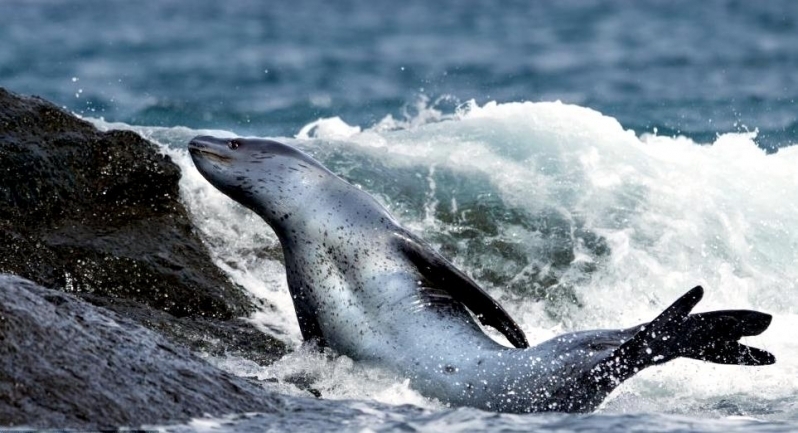 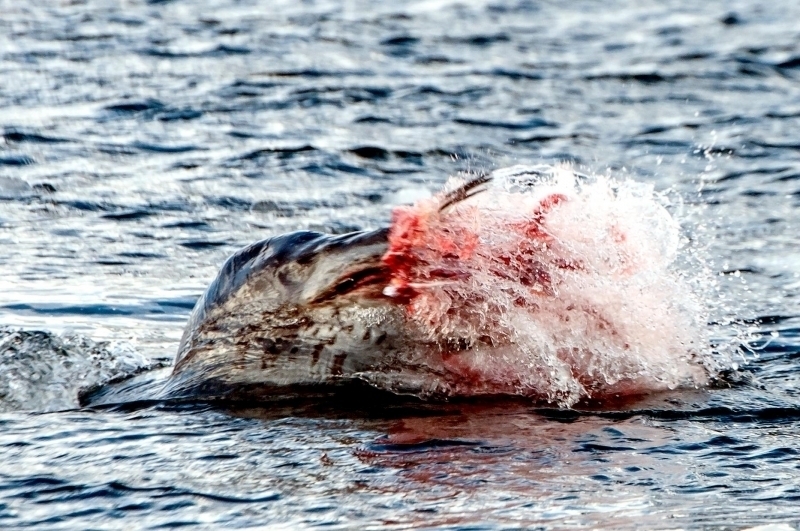 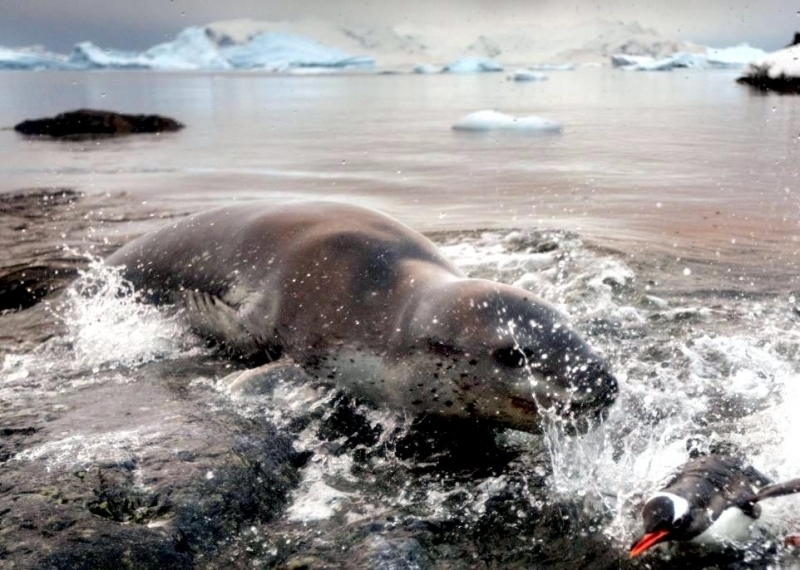 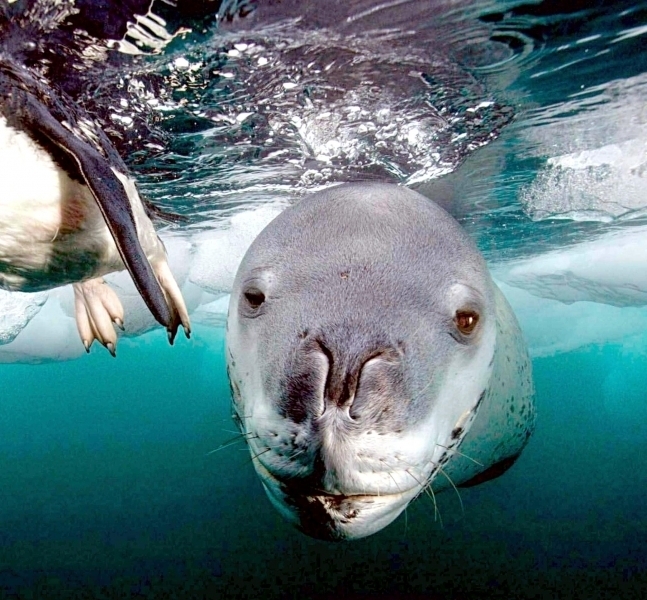 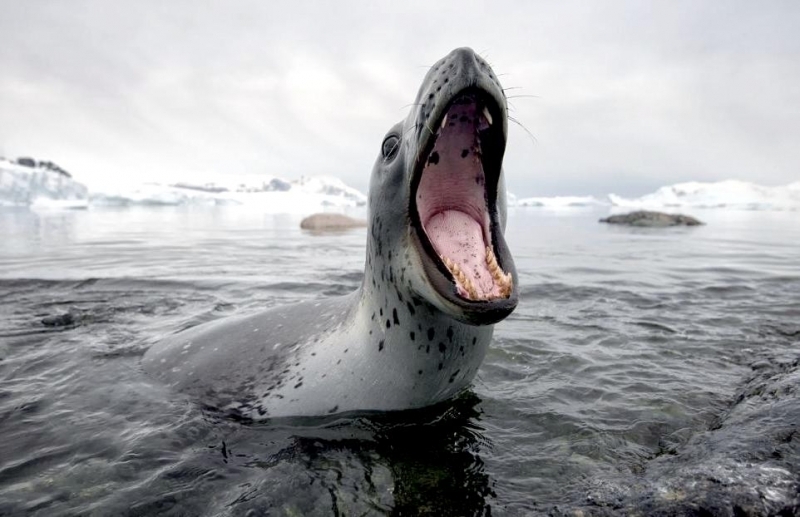 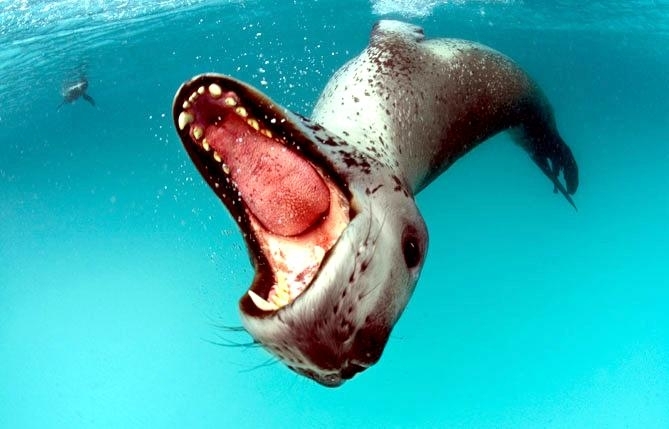 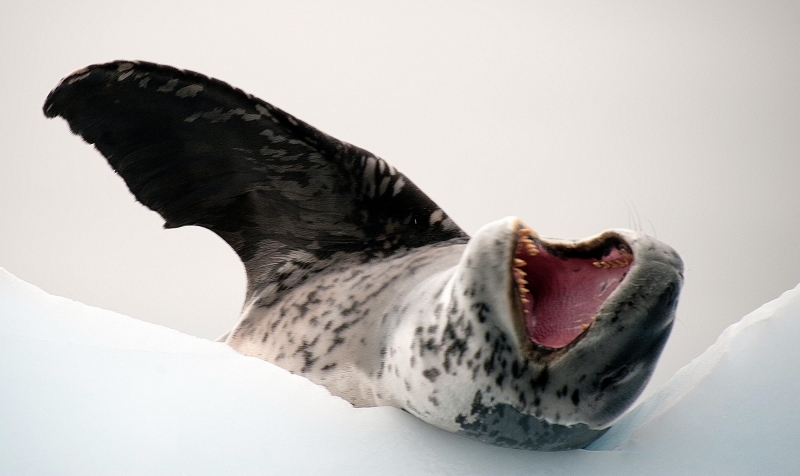 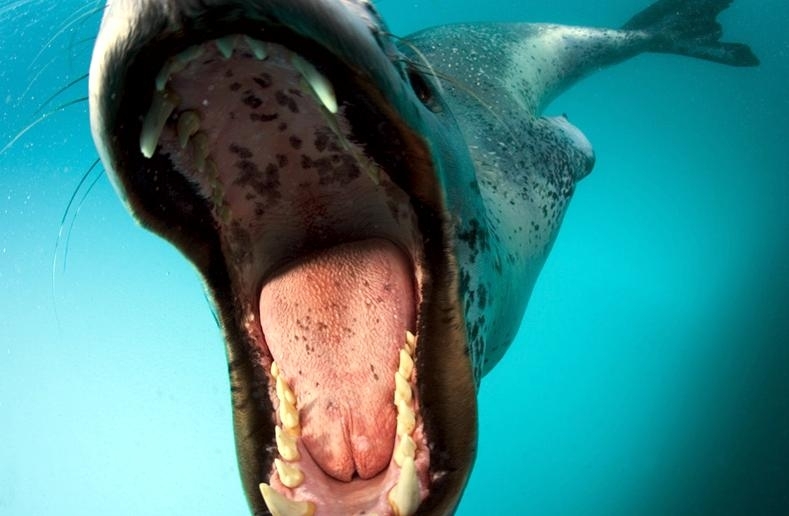 Leopard Seals are awkward on land however, their unusually large fore-flippers give them speed & agility in the water. 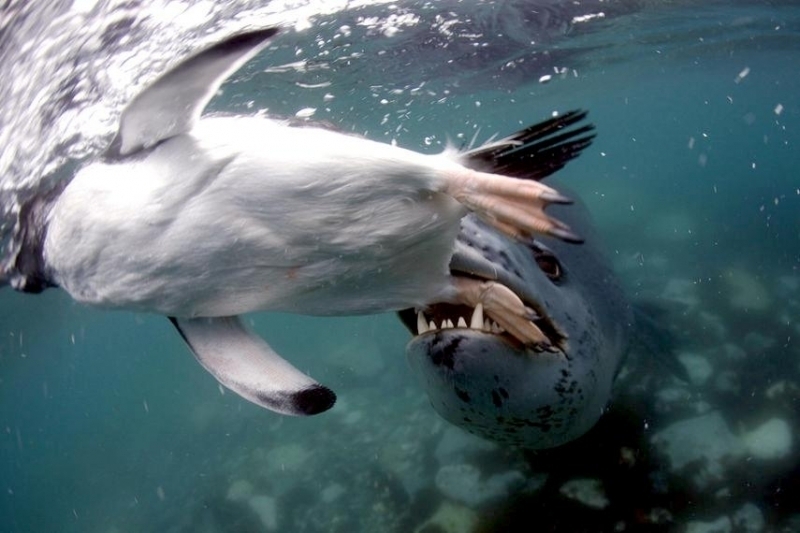 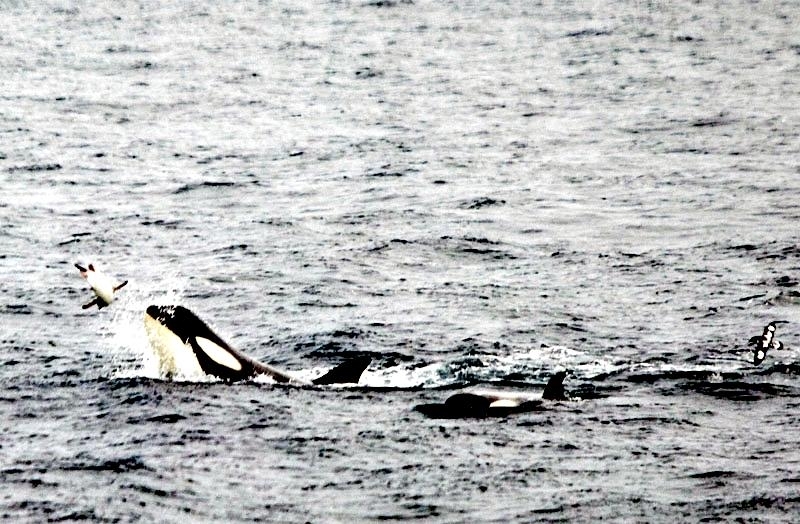 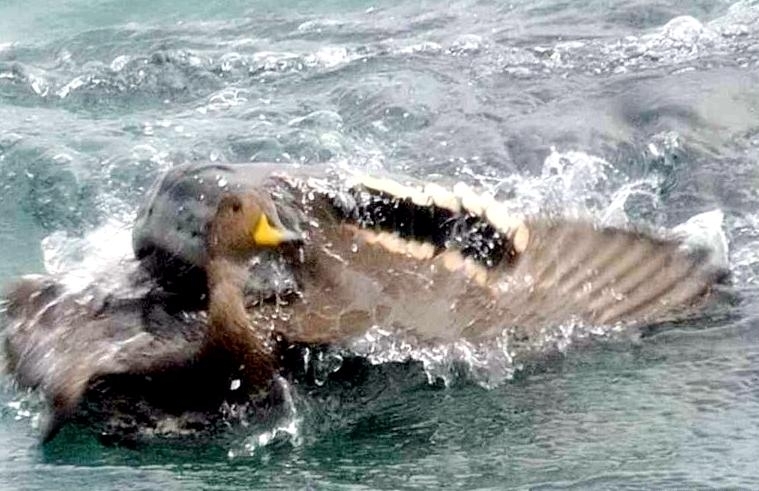 They are sometimes preyed on by Killer Whales. 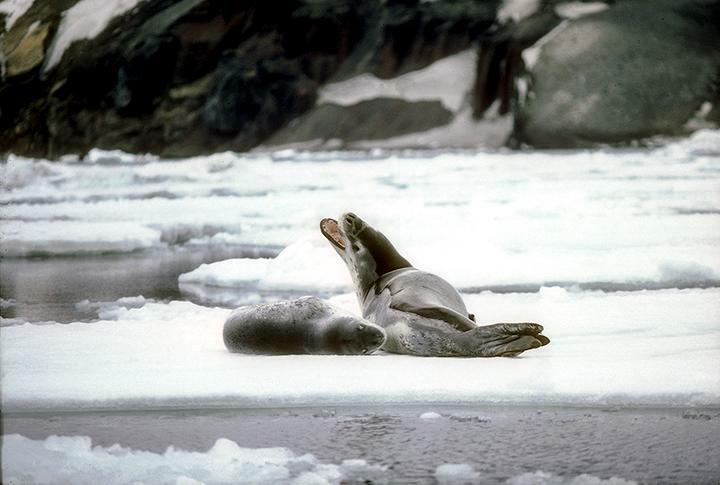 Males reach sexual maturity between age 6-7, females 3-7. 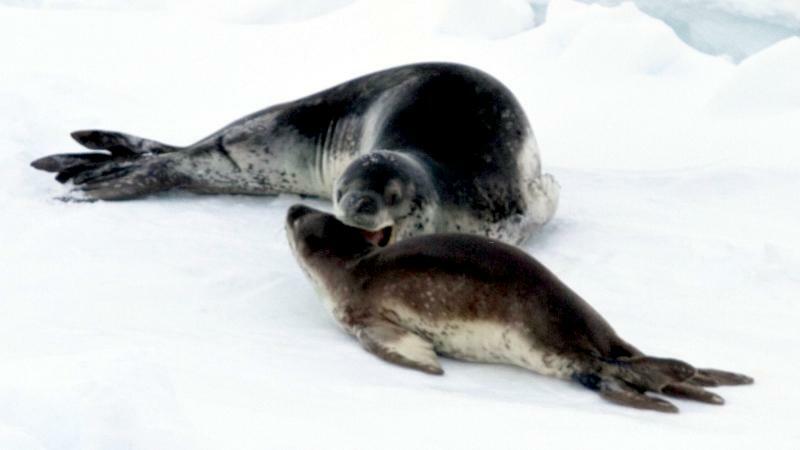 Mating season lasts from November to February. 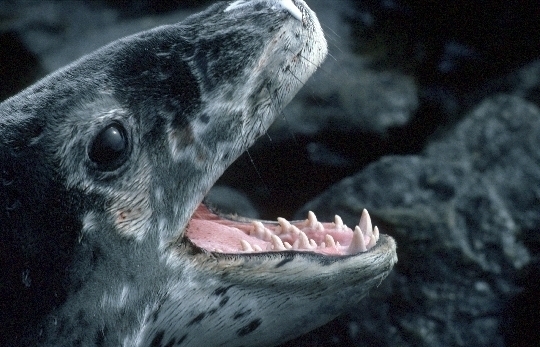 Males are thought to be serially polygamous. 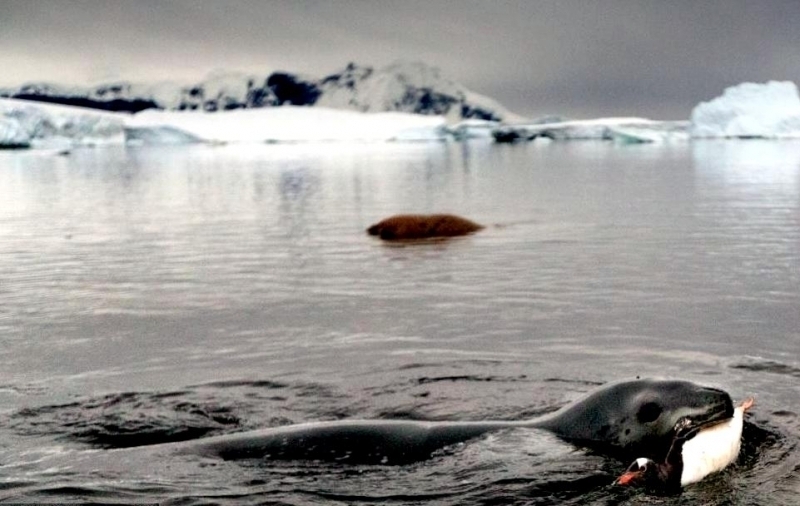 Gestation lasts around 11 months, but implantation appears to be delayed for about 2 months. 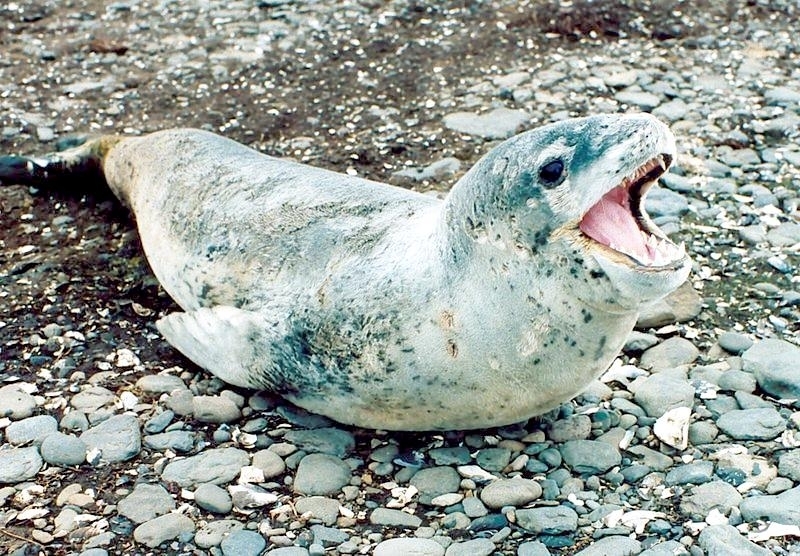 Most births occur in October and November. 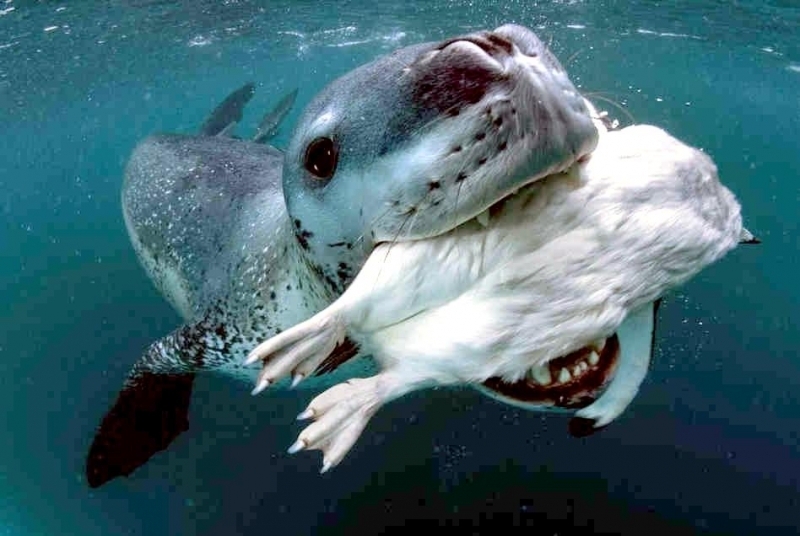 The female gives birth to a single pup weighing about 30 kilograms and about 1.6 meters long and nurses for about a month. 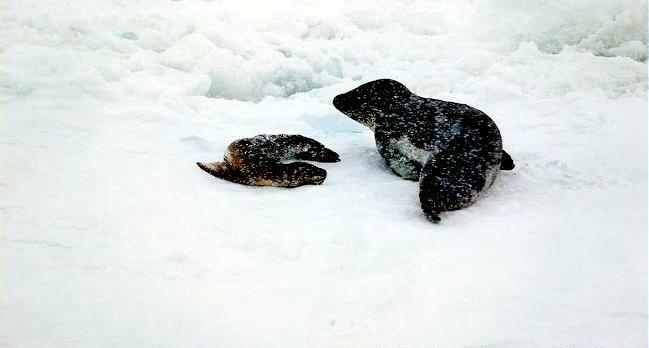 Males do not seem to participate in parental care. 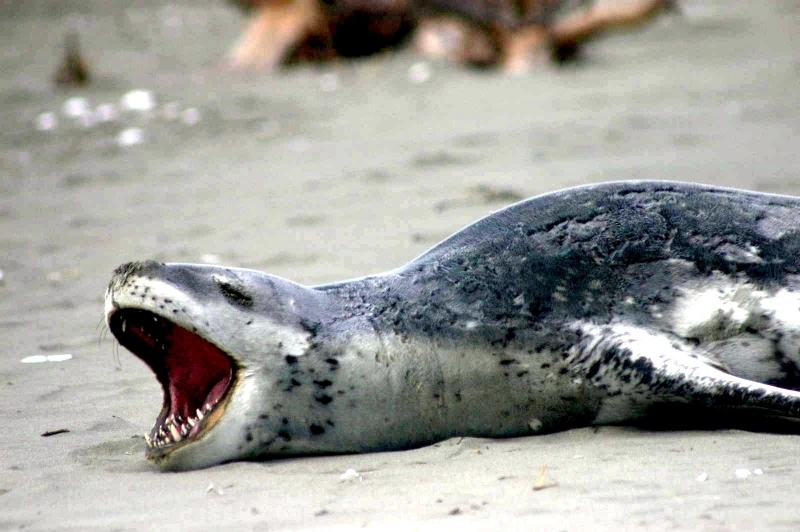 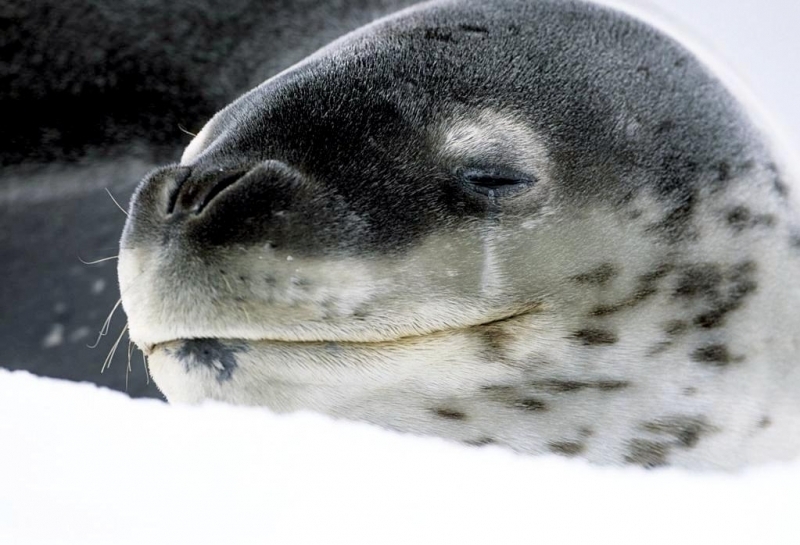 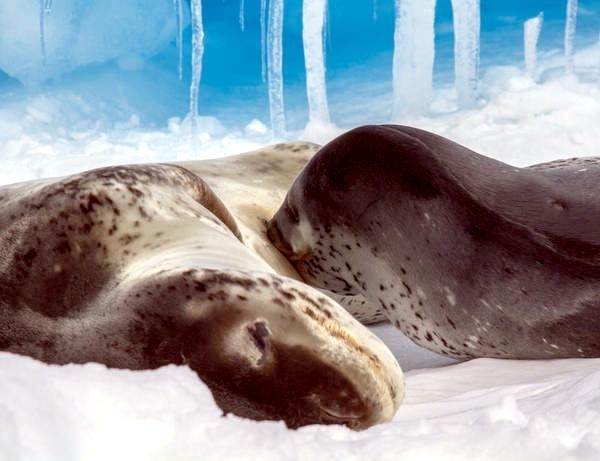 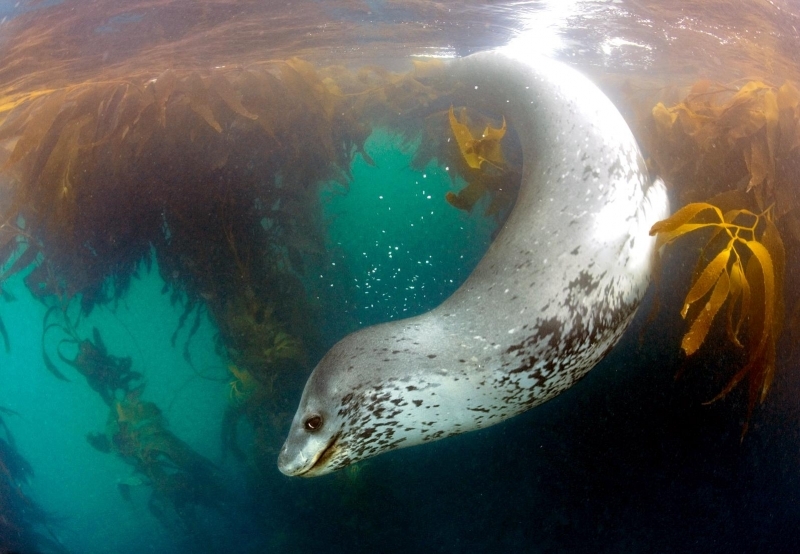 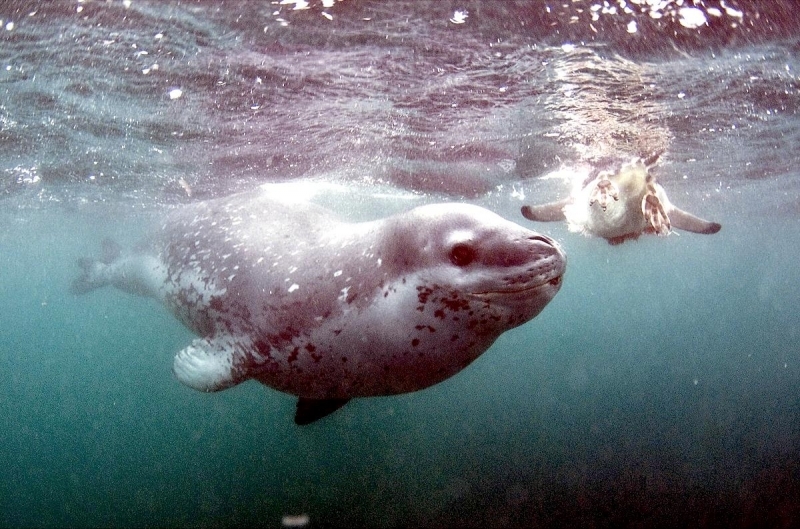 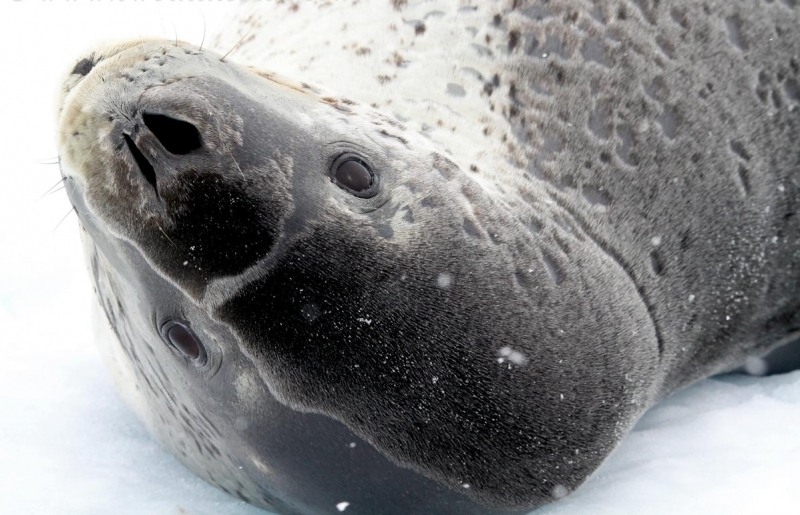 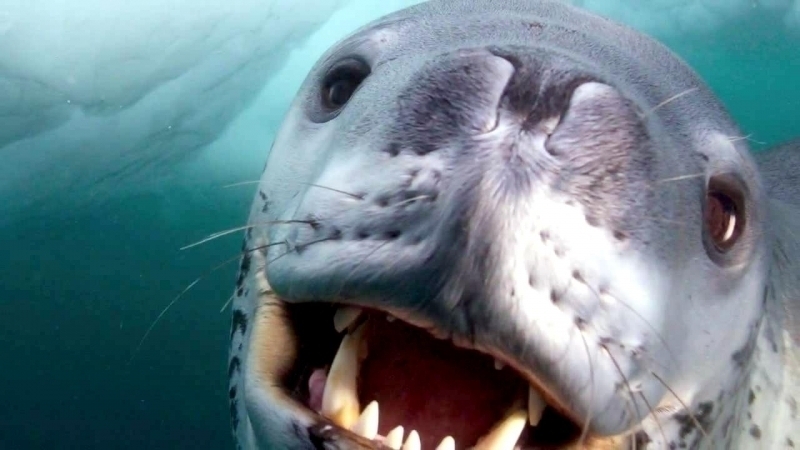 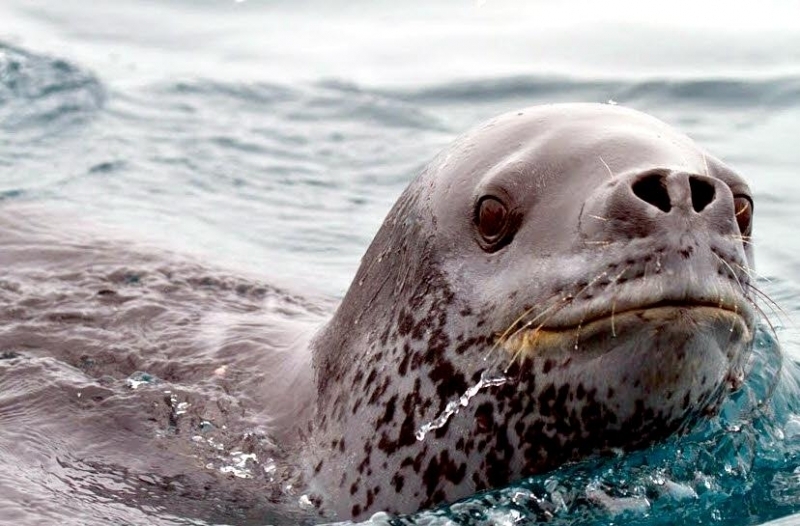 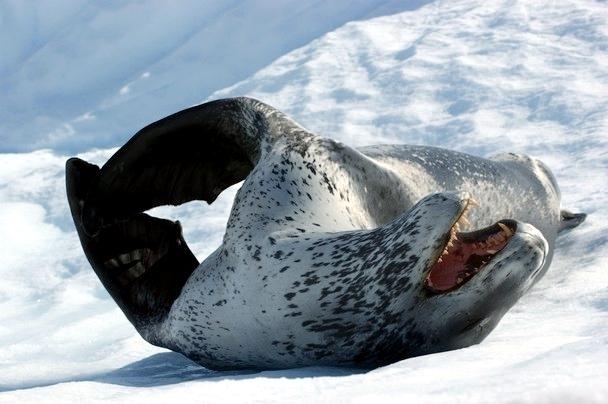 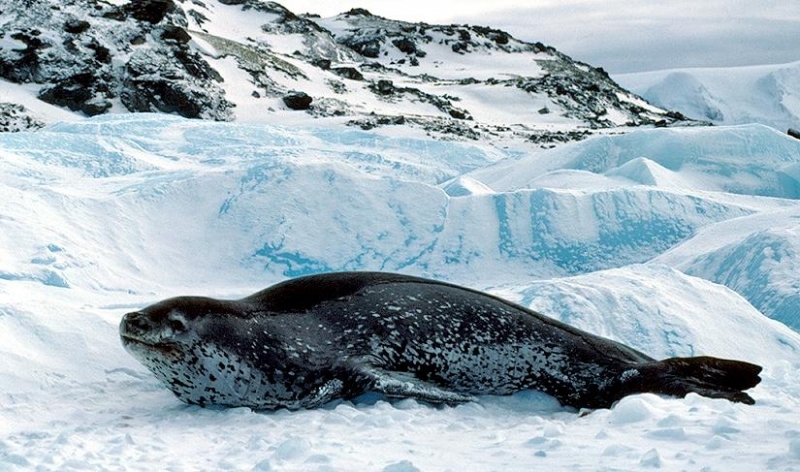 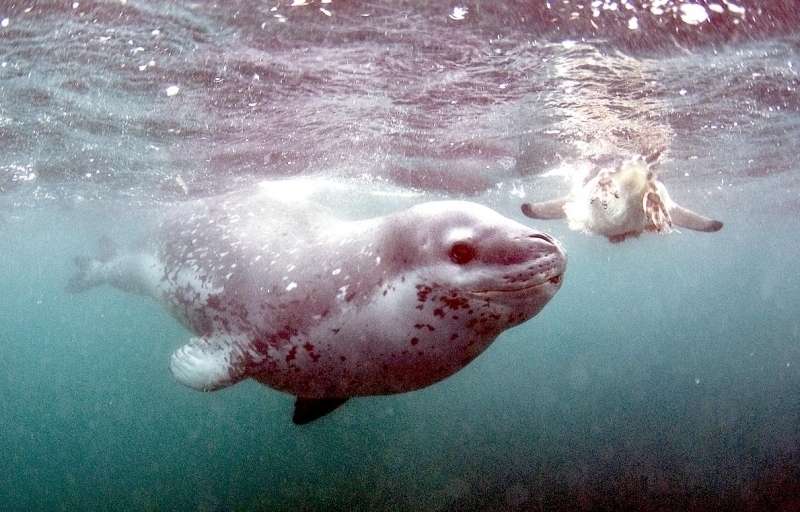 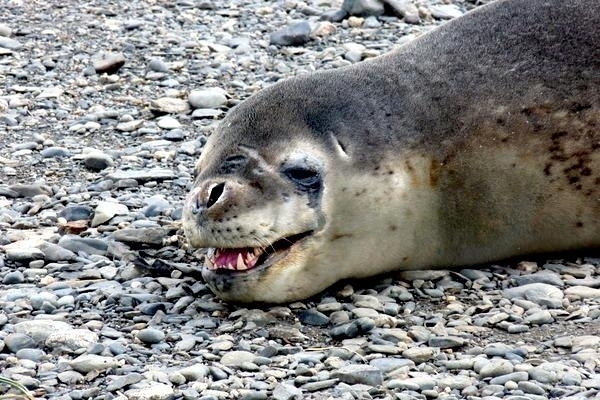 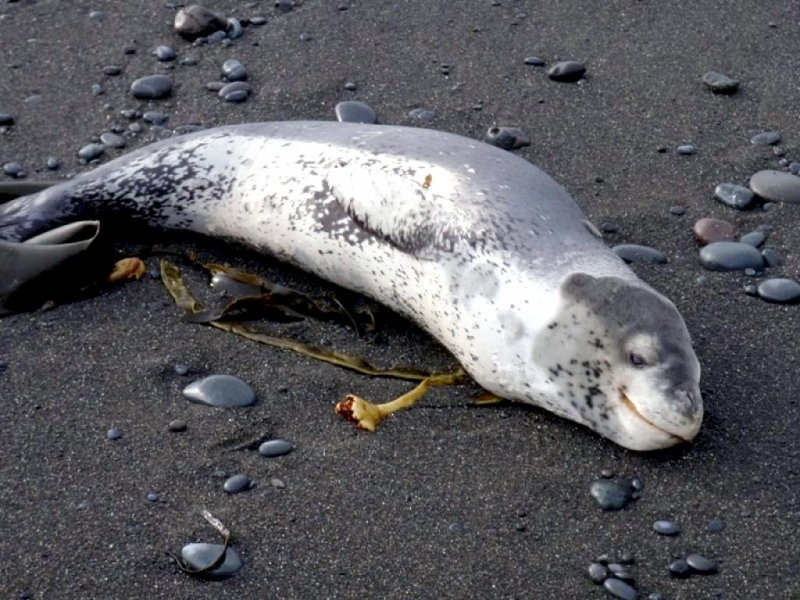 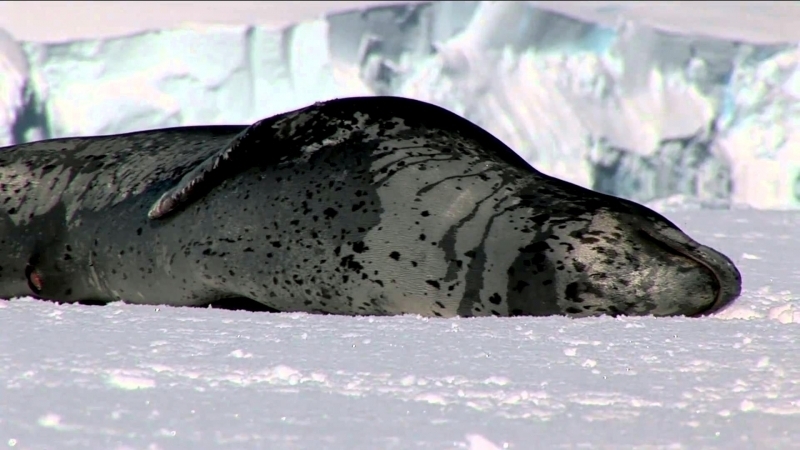 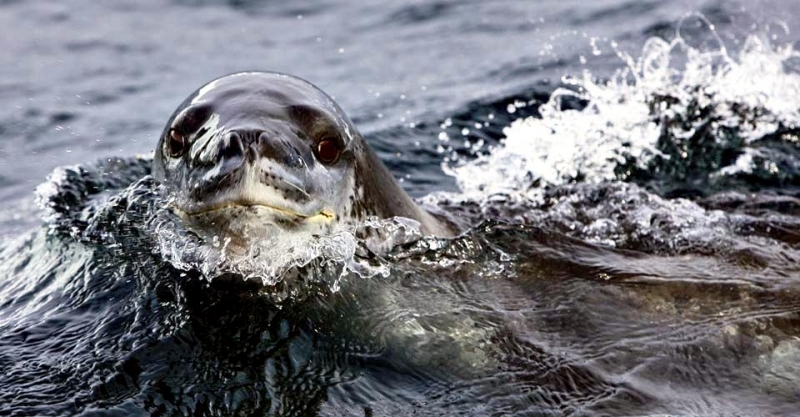 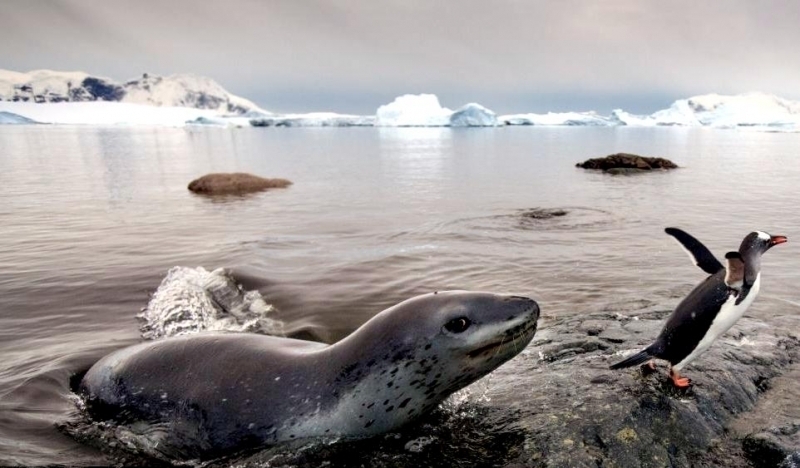 The life span of Leopard Seals is about 26 years.